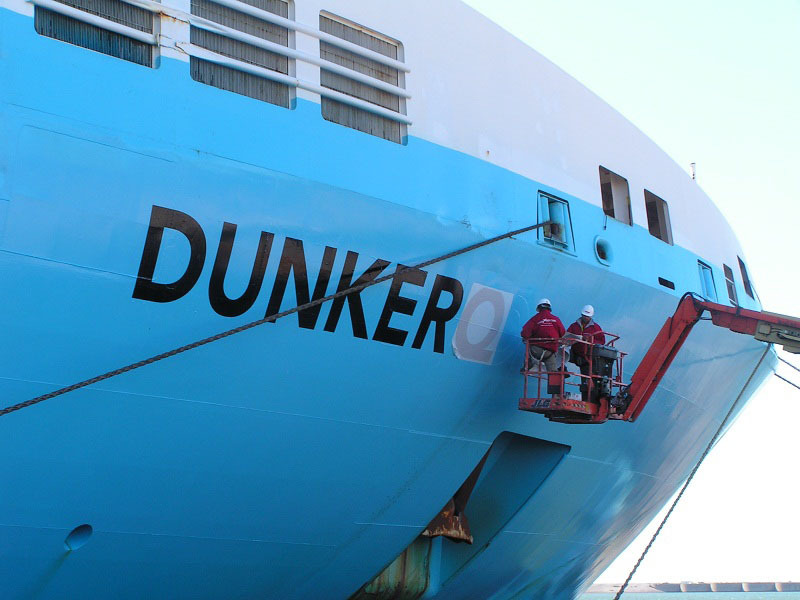 January 11th 2005: MAERSK DUNKERQUE. 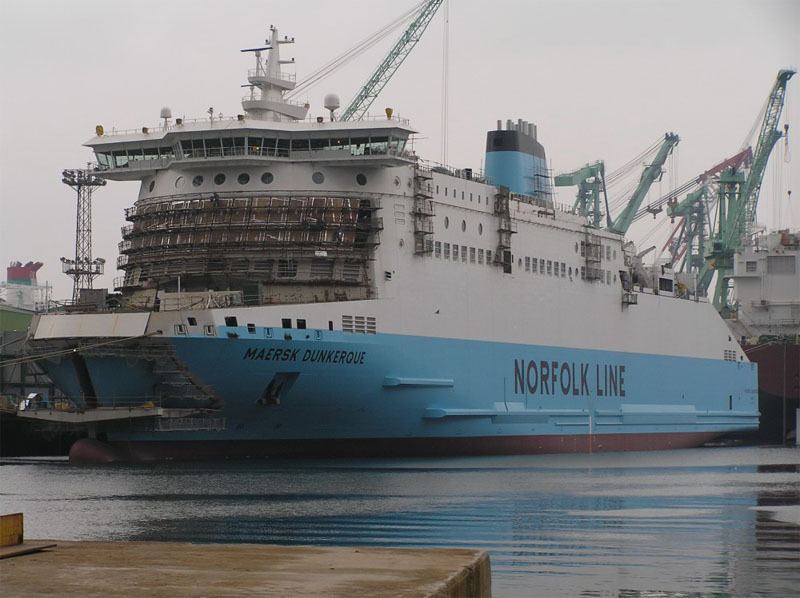 September 27th 2005: Delivered from the Samsung Shipyard to Norfolkline Shipping B.V.
October 15th 2005: Passed through the Suez Canal. 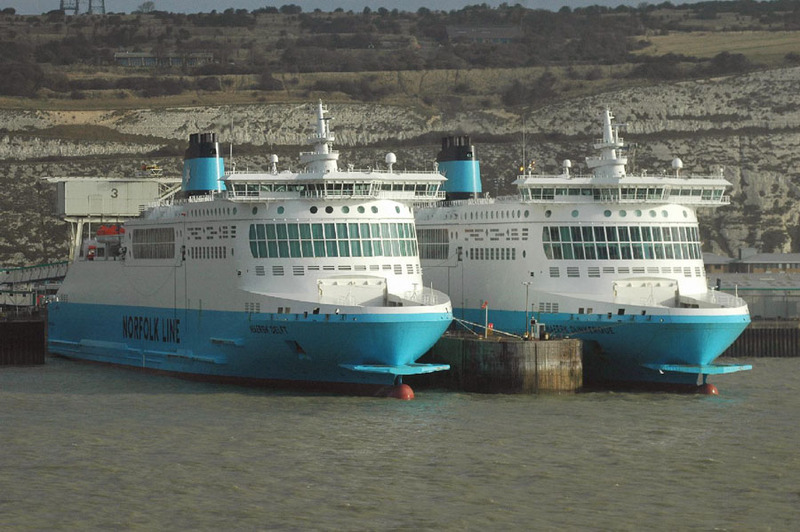 October 22nd 2005: Inaugural arrival in Dover. 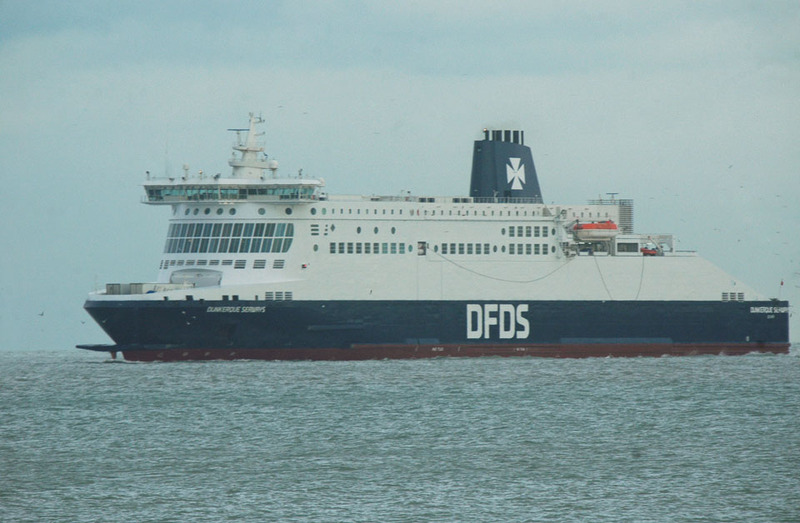 October 24th 2005: Left Dover for Dunkerque. 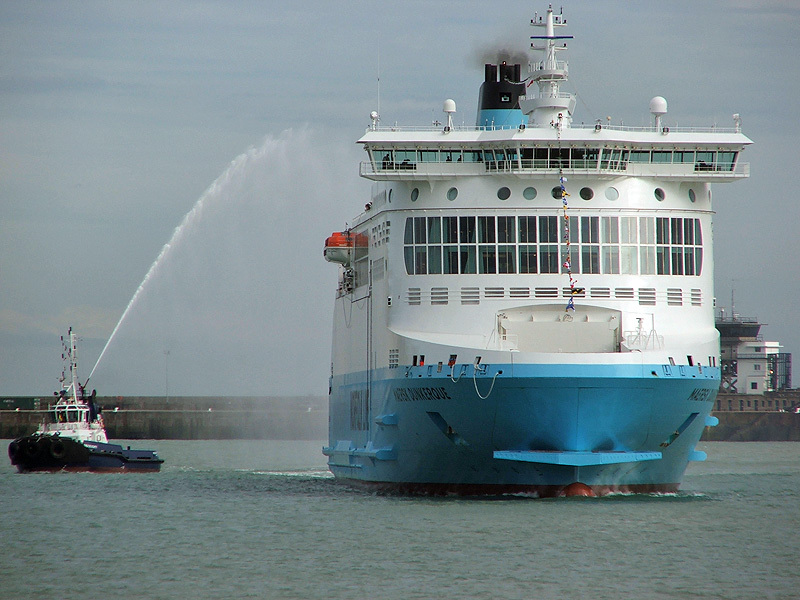 October 24th 2005: First arrival at Dunkerque (trials?). 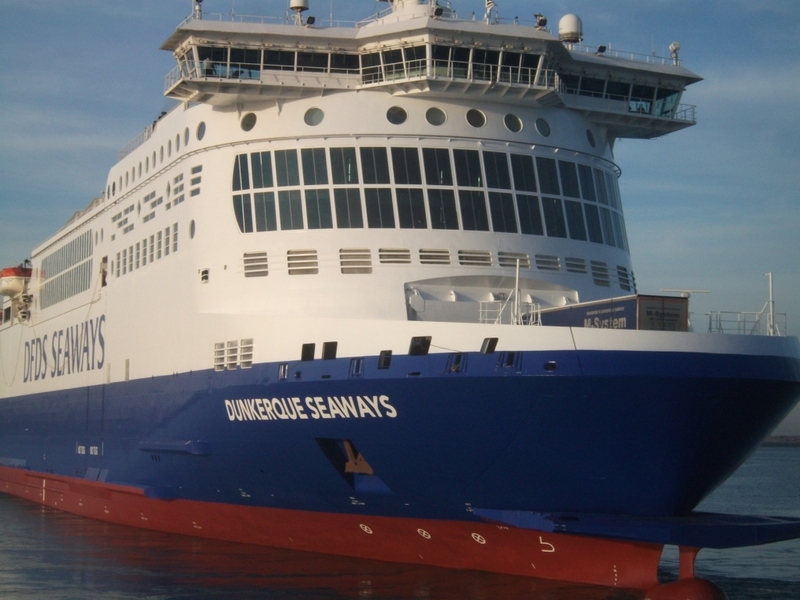 October 28th 2005: Officially named at Dunkerque. 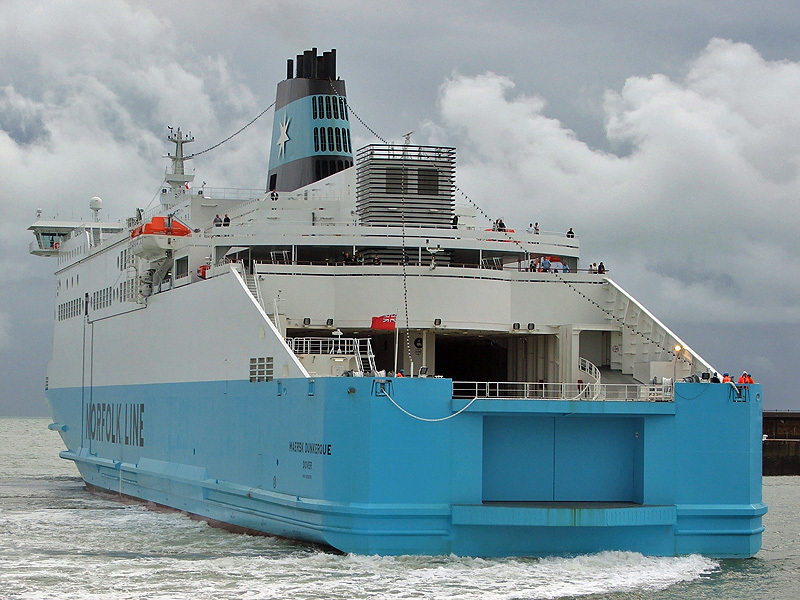 Mrs. Anja Visbeen, accompanied by her husband, Adrie Visbeen, Director and owner of Visbeen Transport Group, honoured Norfolkline by naming the new building MAERSK DUNKERQUE. 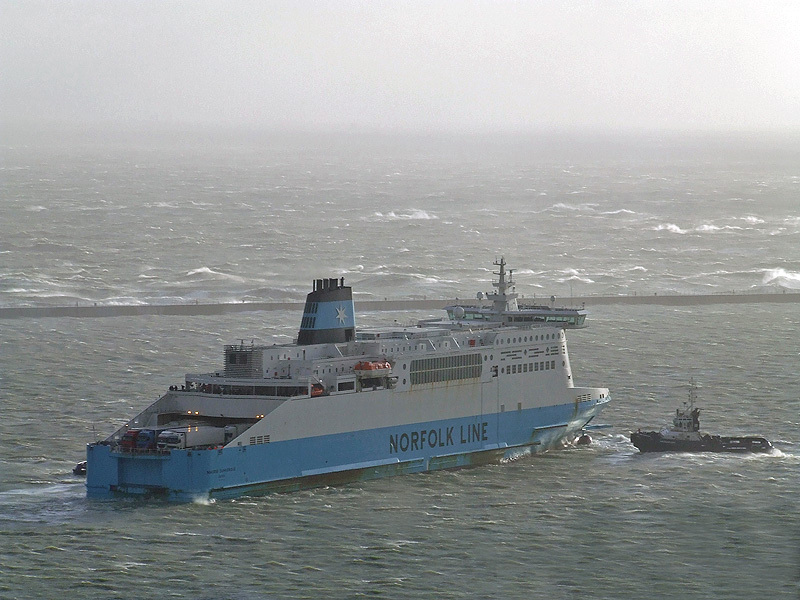 November 2005: Deployed on Dover-Dunkerque service. 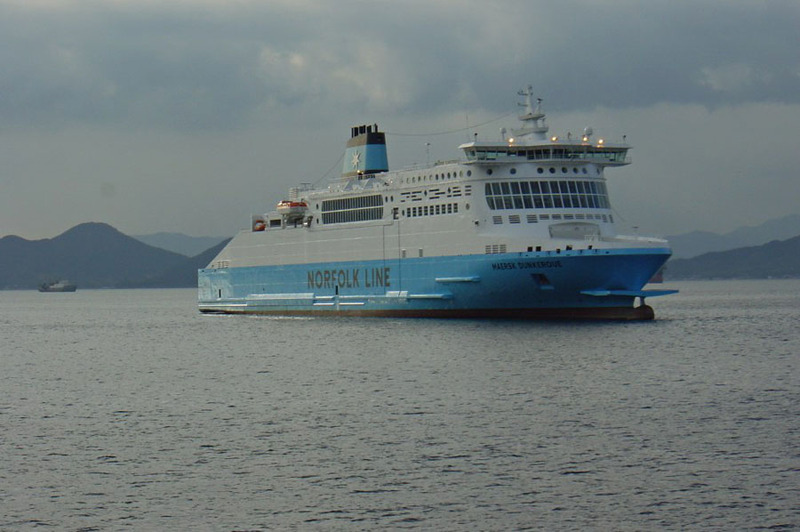 The second and third vessels, MAERSK DELFT and MAERSK DOVER are due to commence service in January and July 2006 respectively. 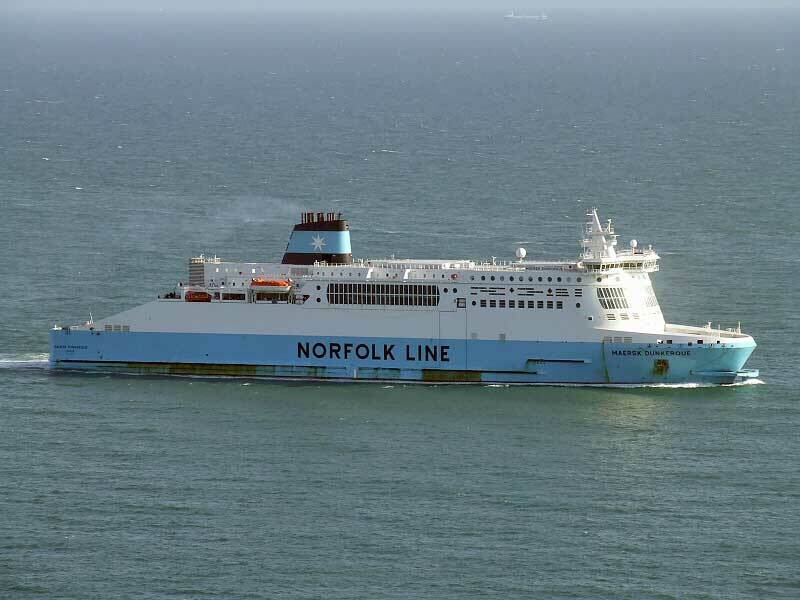 February 20th 2006: Again suffered engine problems consequently a proposed “sail by” (rumour) of the newly arrived MAERSK DELFT at Dover, was cancelled. 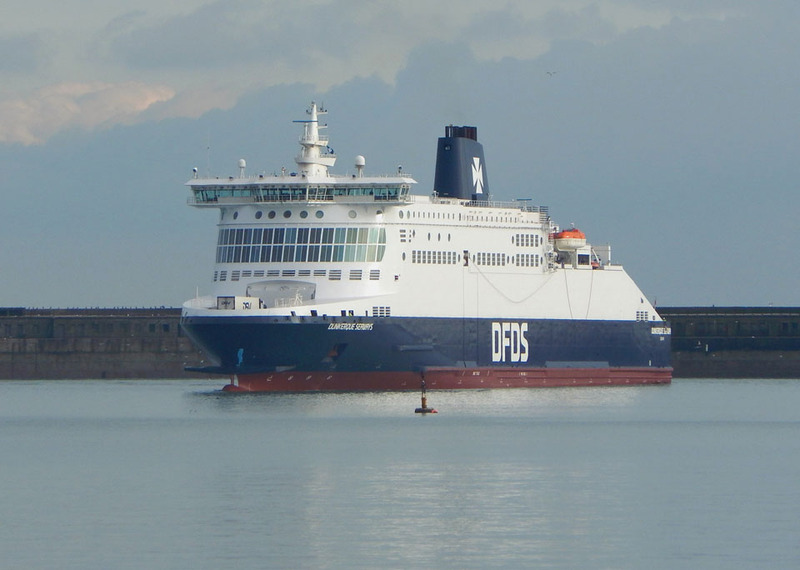 Spent the day in berth 2 at Dover. 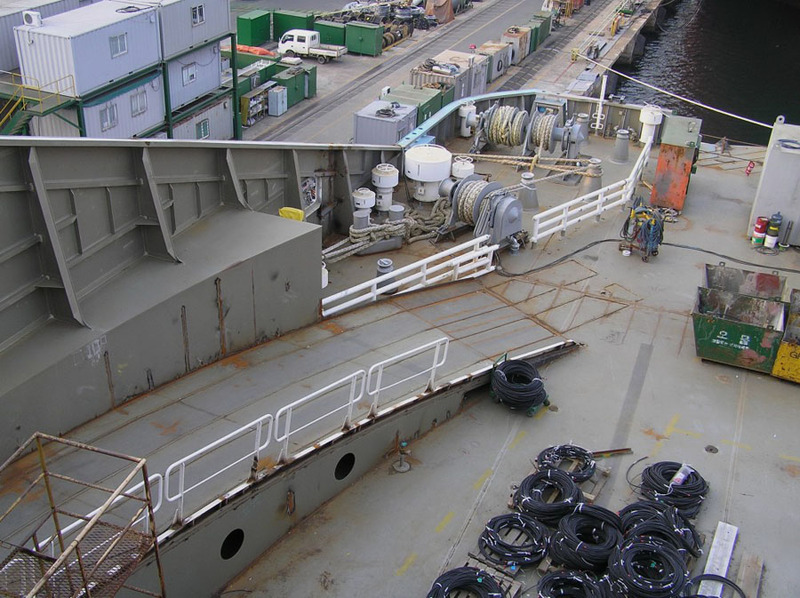 February 27th 2006: To ARNO’s Dunkerque for her first routine annual hull inspection and repairs to the oil leak. 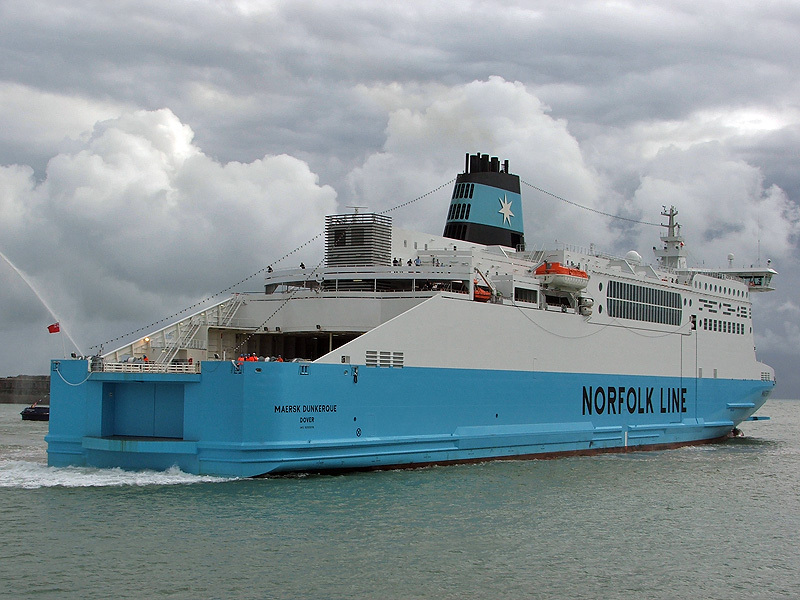 The local (Dover) engineering firm Burgess undertook the work for Norfolk Line to repair the vessel. 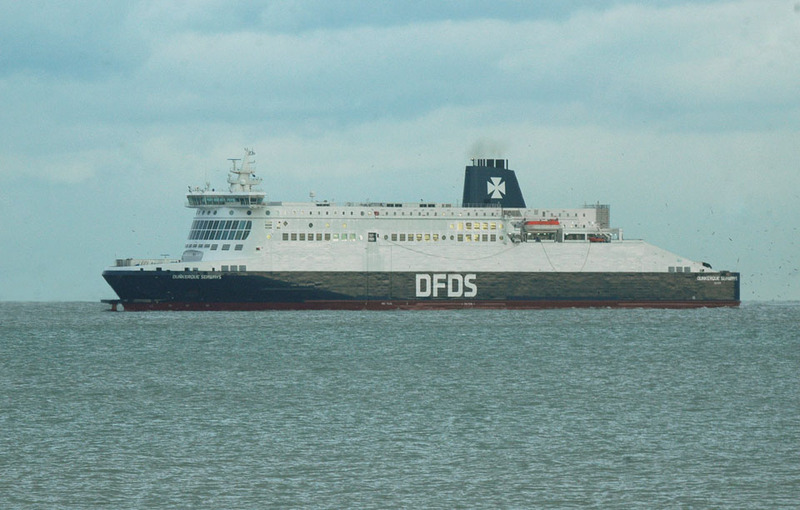 March 4th 2006: Left Dunkerque East, seen heading north. 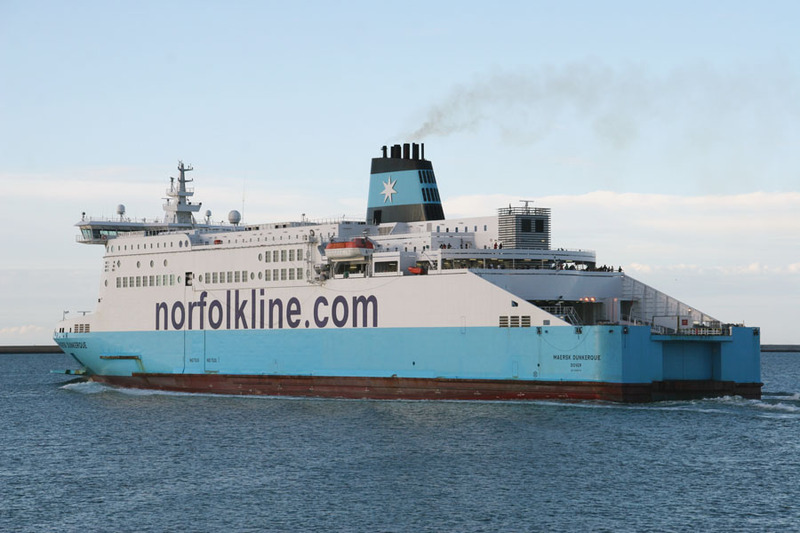 March 5th 2006: Resumed commercial sailings. 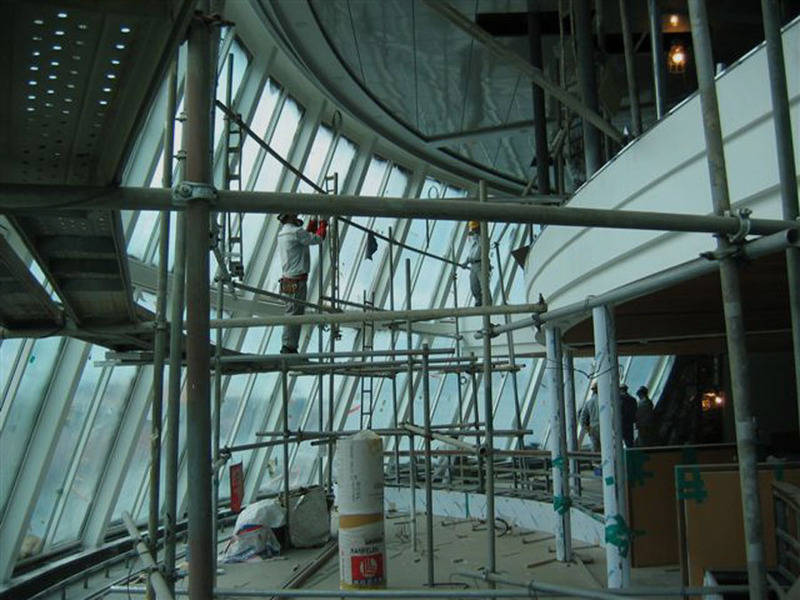 March 12th 2006: Resumed commercial service. 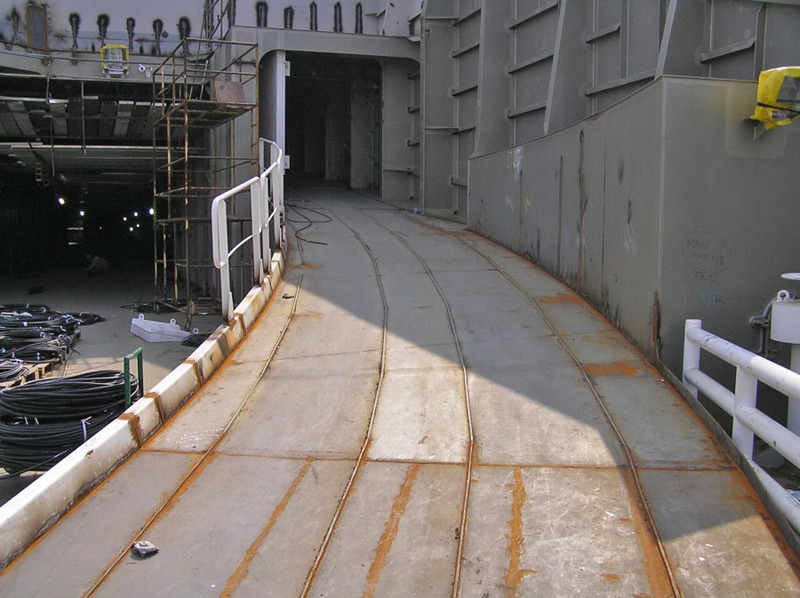 July 25th 2006: Berthed at Cruise terminal 2 for maintenance. July 28th 2006: All 3 sisters running from 1200 today. 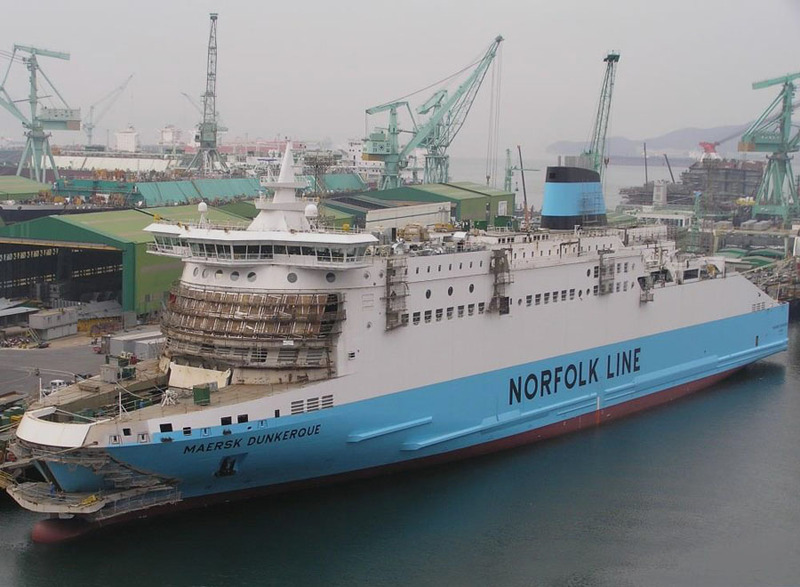 4th September 2006: Maersk Dunkerque suffering from engine problems required the assistance of DHB Doughty. 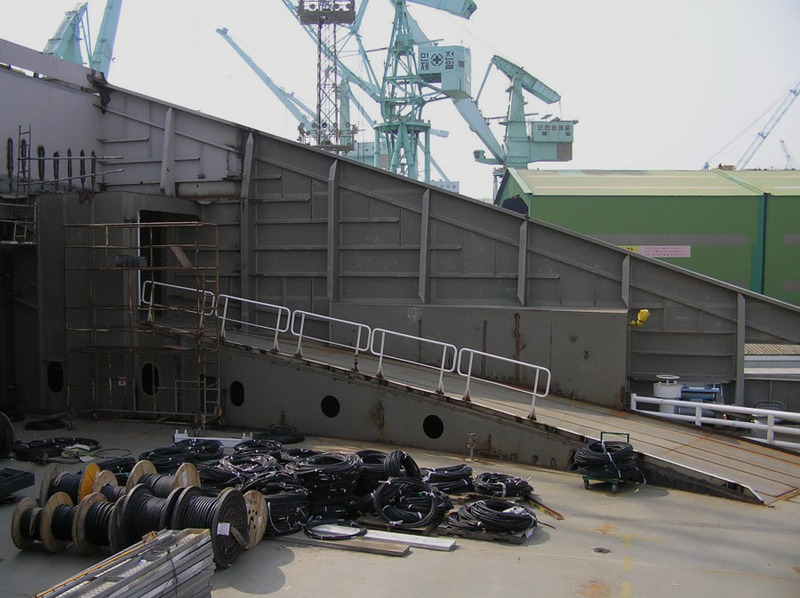 24th December 2006: Proceeded to the Scheldepoort Dockyard, Vlissingen (Flushing), Netherlands for a scheduled dry docking. 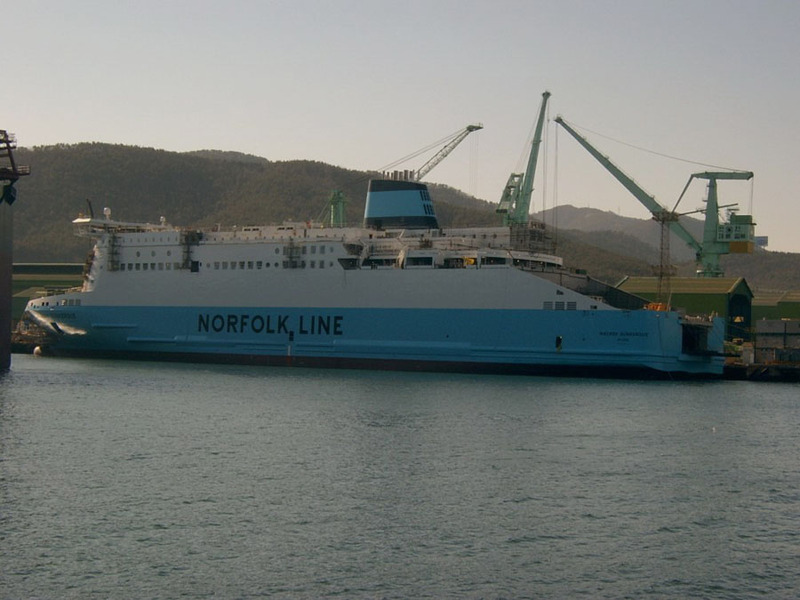 8th January 2007: Departed the Scheldepoort Dockyard at 16:00 local time bound for Dunkerque. 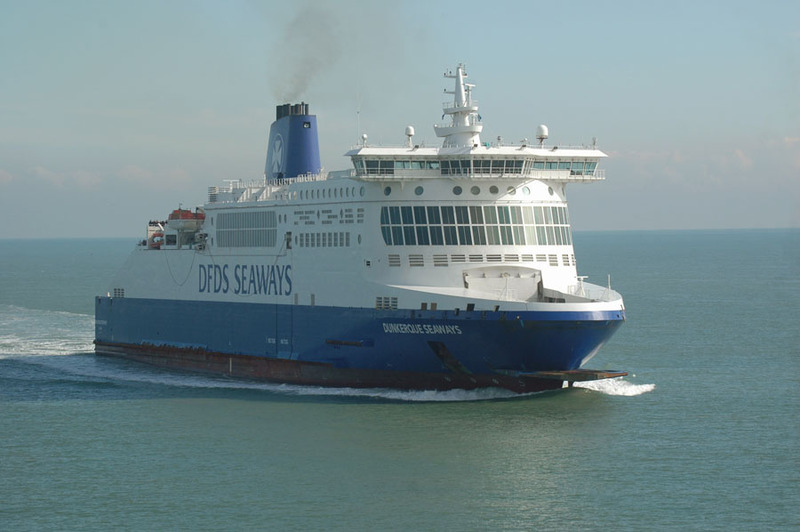 11th January 2007: Resumed service from Dover to Dunkerque. 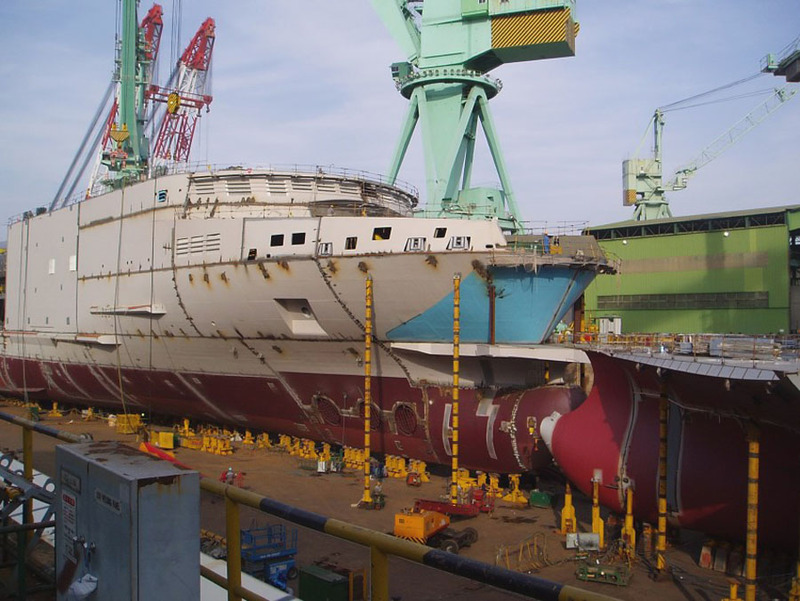 January 20th 2008: To ARNO Dunkerque for refit. 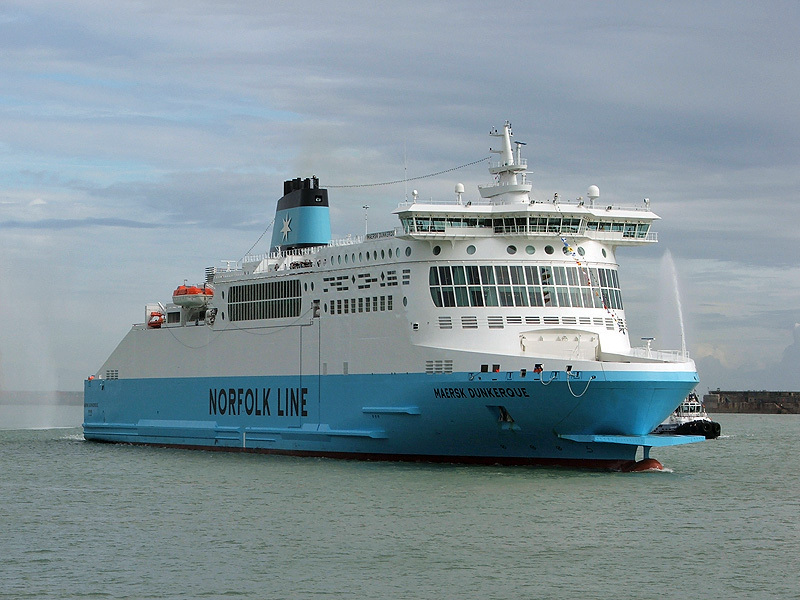 January 31st 2008: Left ARNO sporting the new Norfolk Line . com livery. 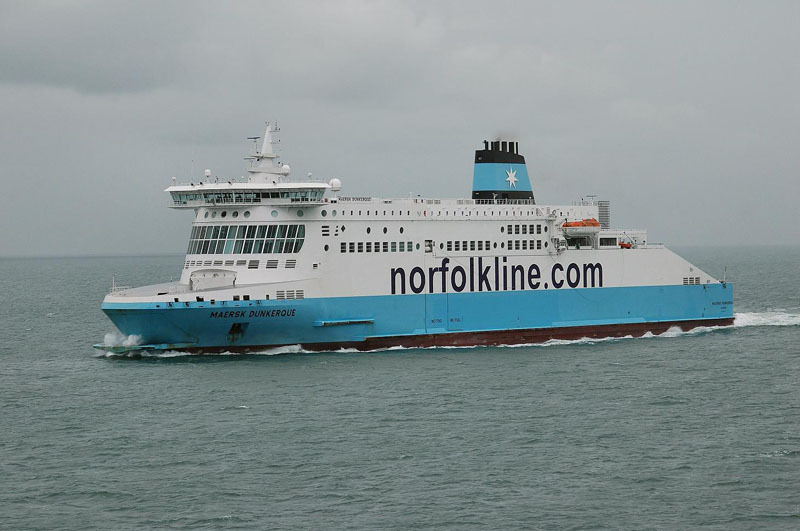 January 28th 2009: To ARNO Dunkerque for refit. 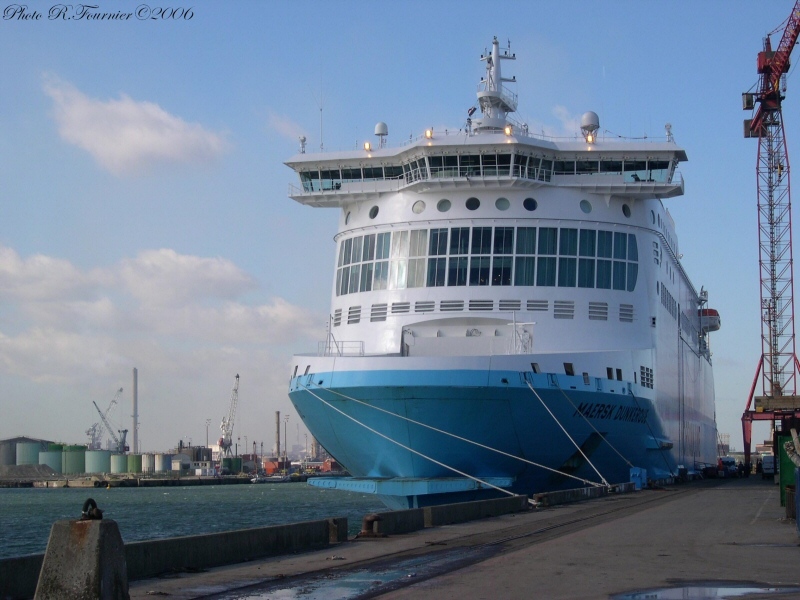 February 4th 2009: Left ARNO and went to Zeebrugge for berthing trials. 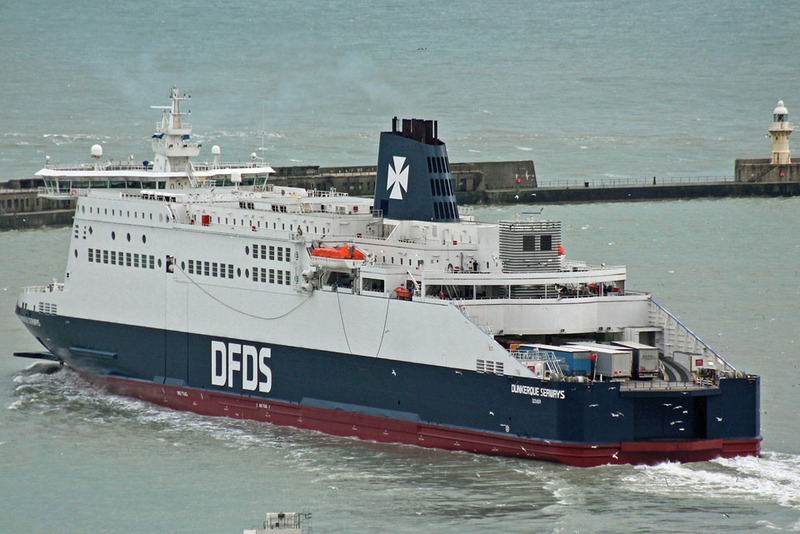 February 5th 2009: Resumed Dover – Dunkerque. 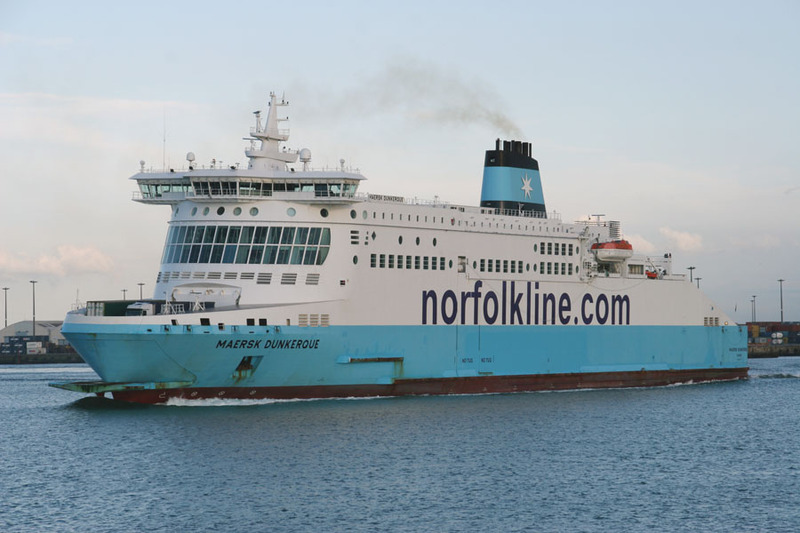 December 17th 2009: Following months of speculation it was announced that DFDS A/S had acquired Norfolkline from A. P. Moller – Maersk for €346 million subject to regulatory approval. 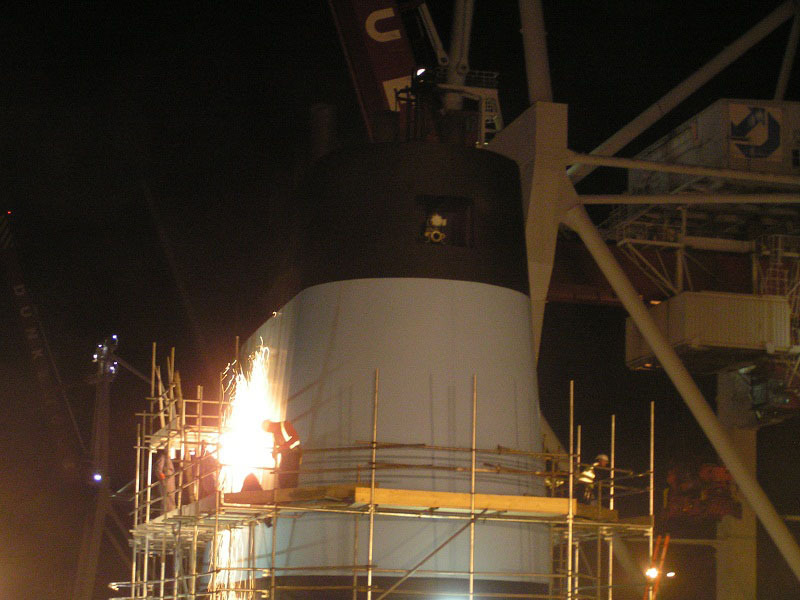 January 22nd – January 29th 2010: Refit at ARNO, Dunkerque. 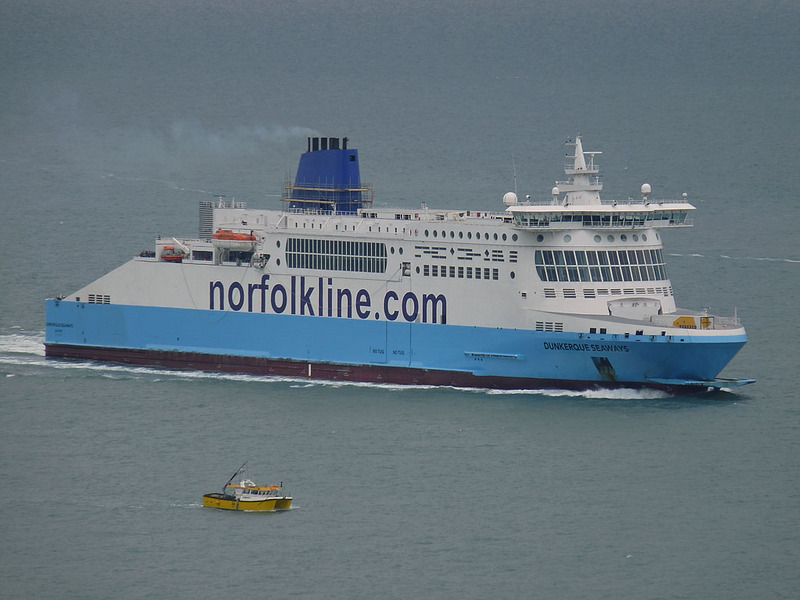 January 29th 2010: Arrived back in Dover and resumed service. 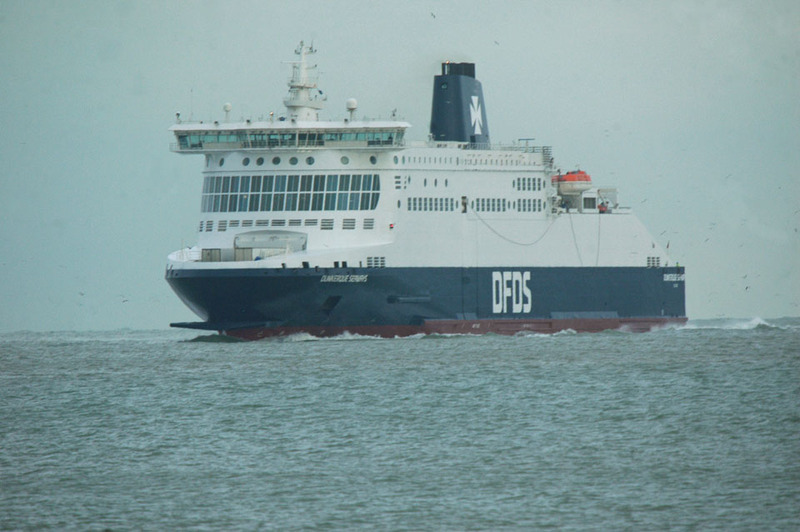 7th August 2010: DFDS Funnel markings applied whilst alongside in Dunkerque. 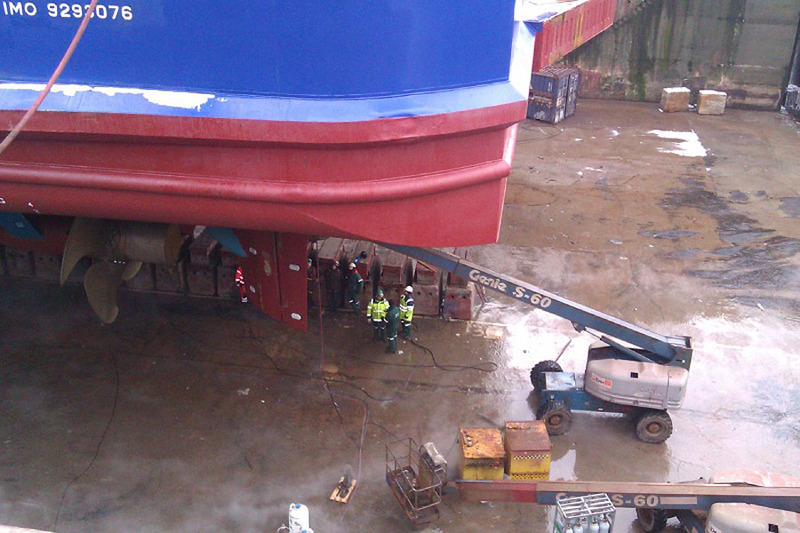 28th January 2011: Refit at ARNO Dunkerque. 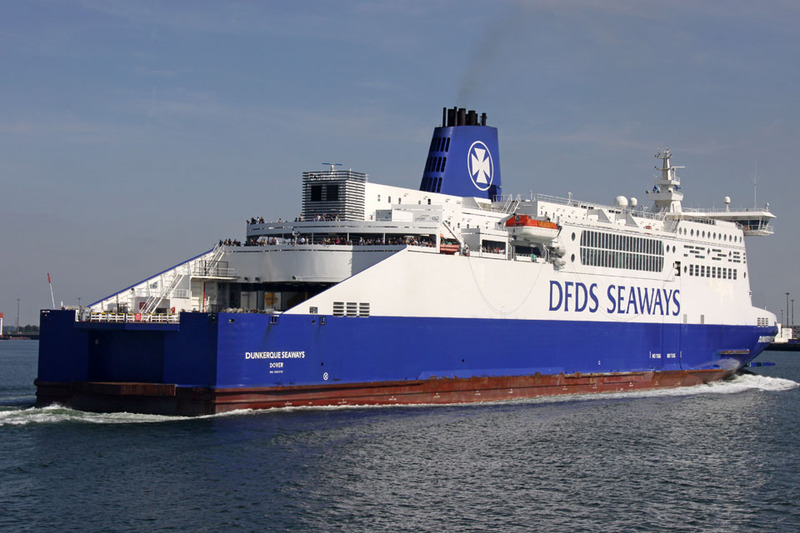 Received full DFDS Seaways livery. 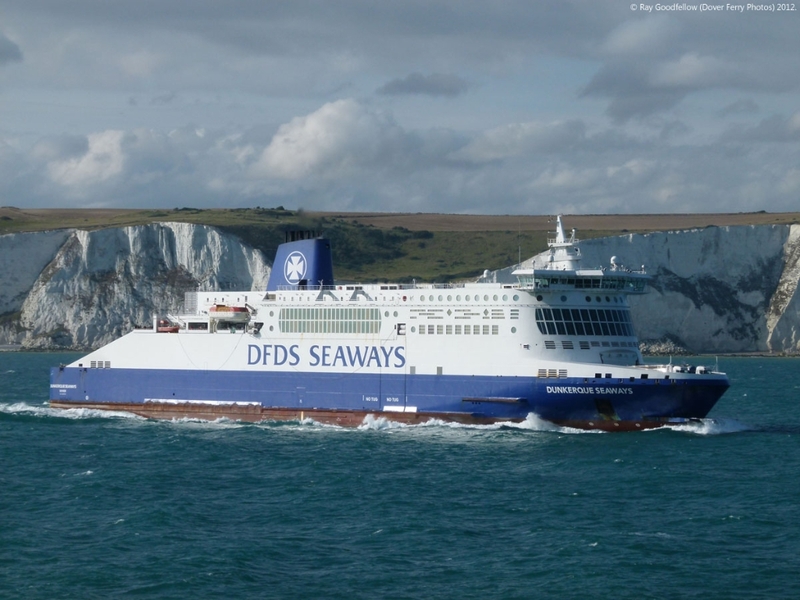 5th February 2011: Resumed service between Dover and Dunkerque. 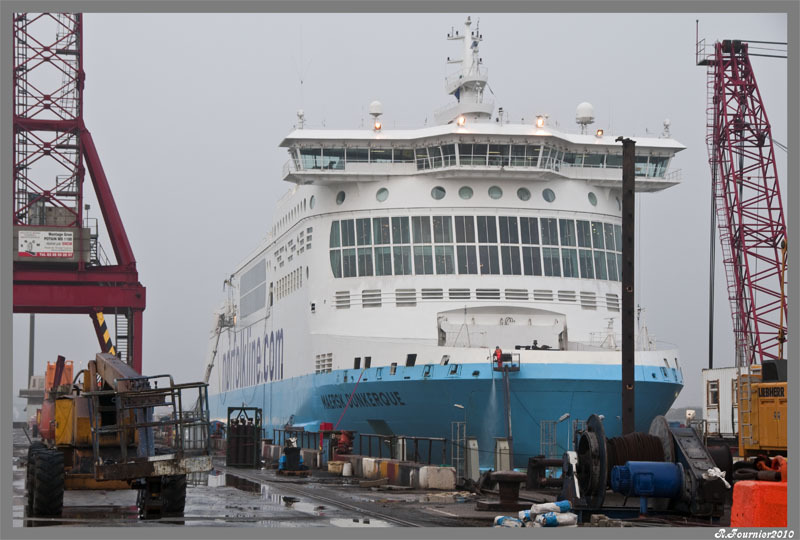 9th January 2012: Arrived at ARNO Dunkerque for an extended refit and installation of a Rolls Royce `Promas Lite’ system. 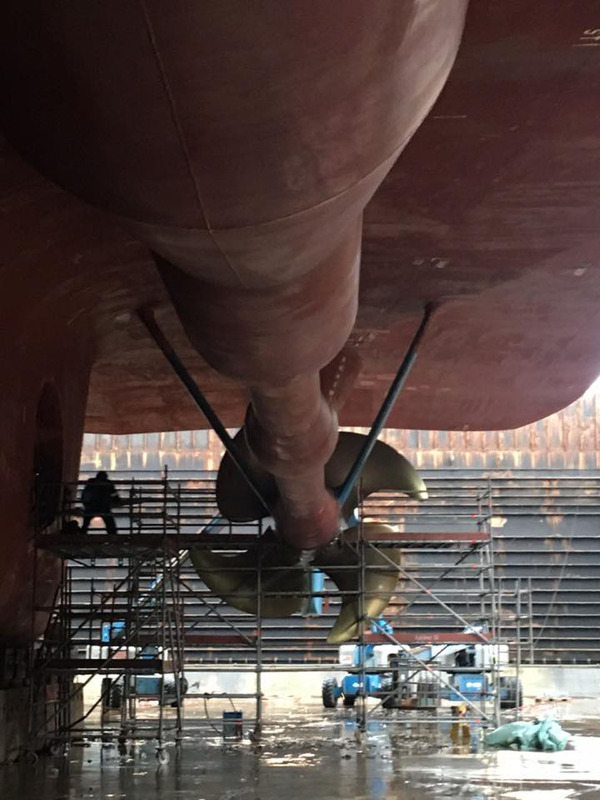 This system consists of adaptations to the rudders and installation of new propellers which is said to offer significant fuel savings. January 17th 2012: Returned to service. 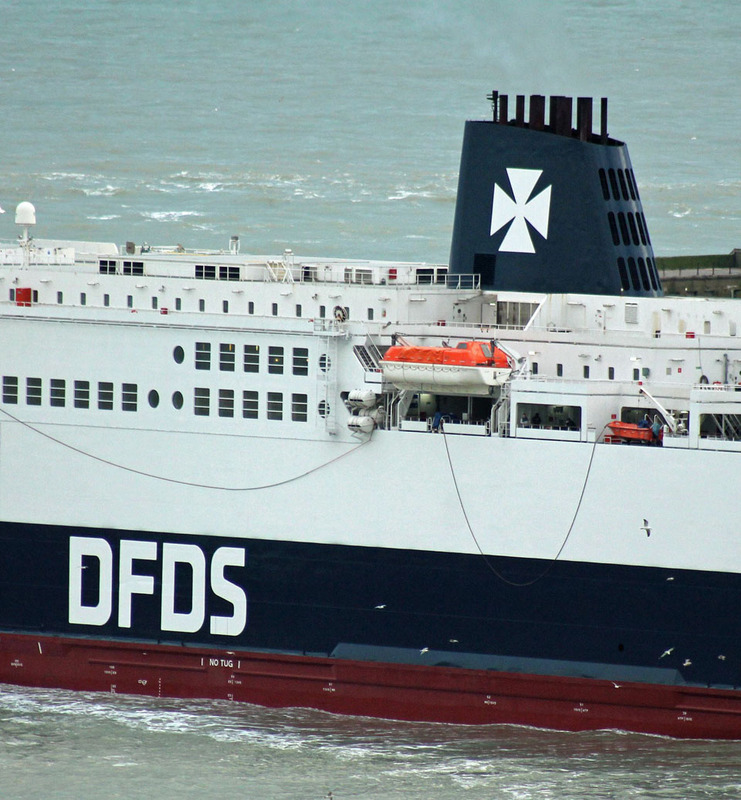 25th April 2012: Made contact with Pier Foxtrot (F) at Dover’s Eastern docks and sustained damage to her starboard bow. 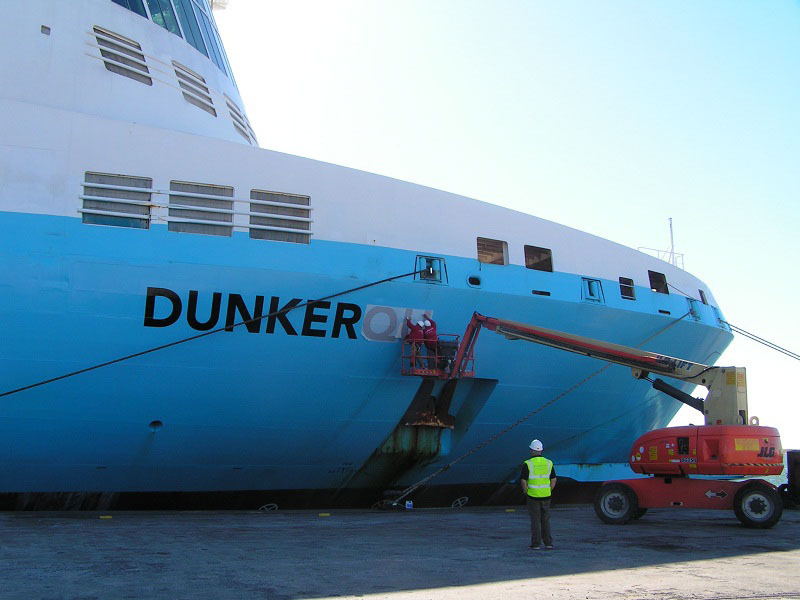 27th April 2012: Arrived at ARNO Dunkerque for repairs. 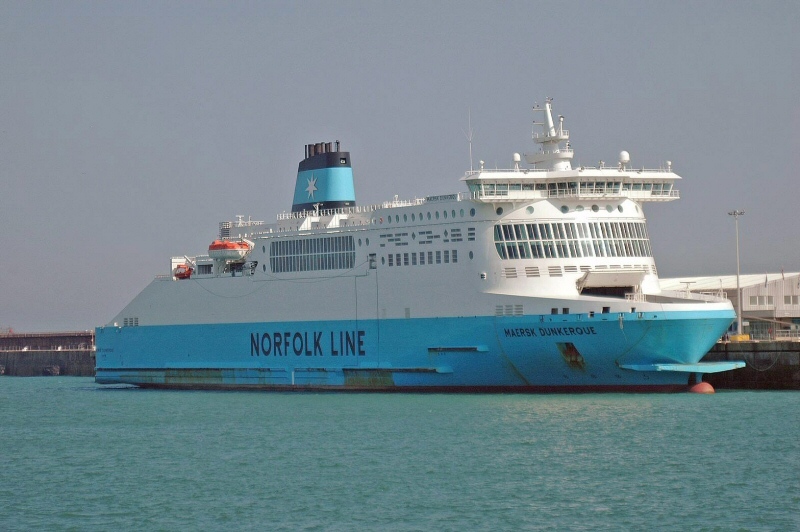 29th April 2012: Returned to service. 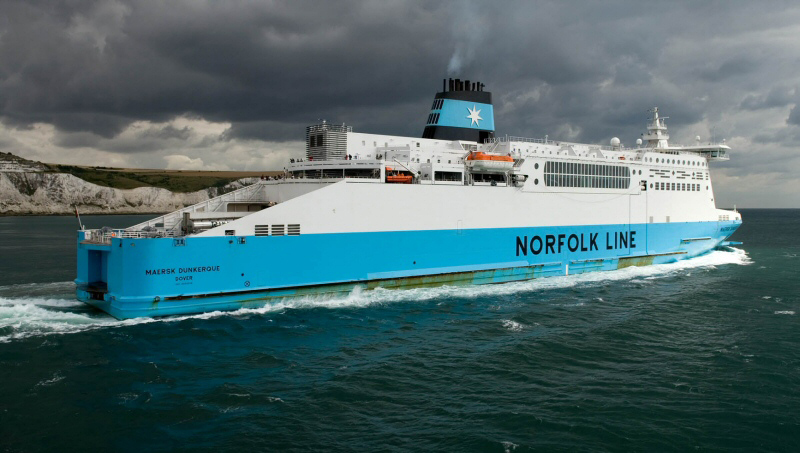 2nd October 2012: Suffered minor damage whilst berthing in Dover. 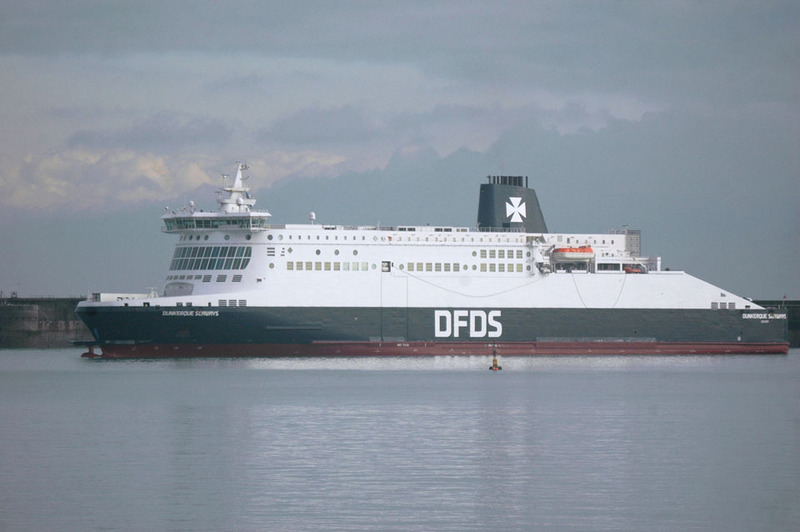 Withdrawn from service and sent to ARNO at Dunkerque for repairs, expected to be out of service for 36 hours. 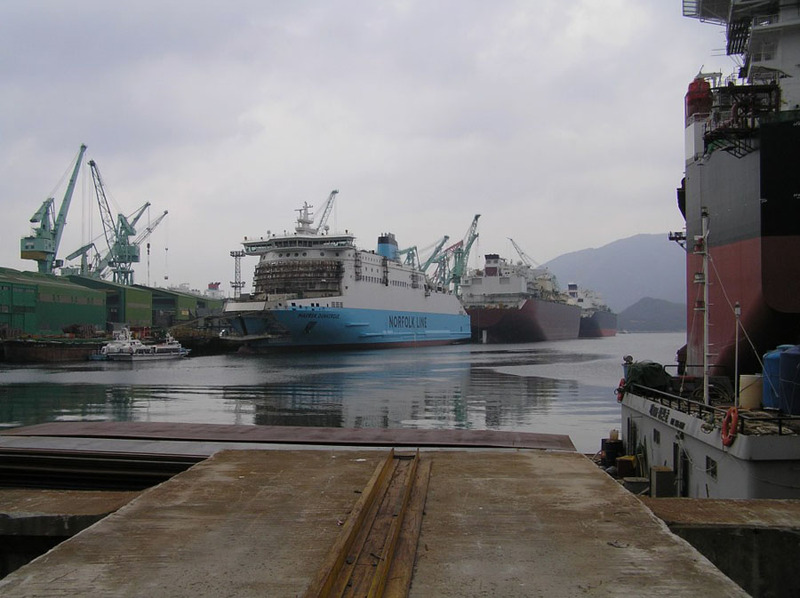 4th October 2012: Departed the ARNO shipyard for Dunkerque West and took up service. 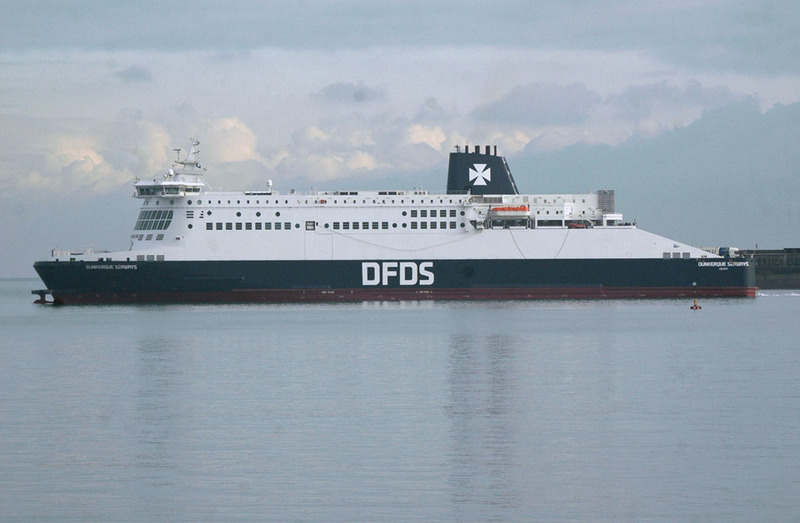 January 12th 2013 (01.00hrs): Resumed service Dunkerque – Dover. 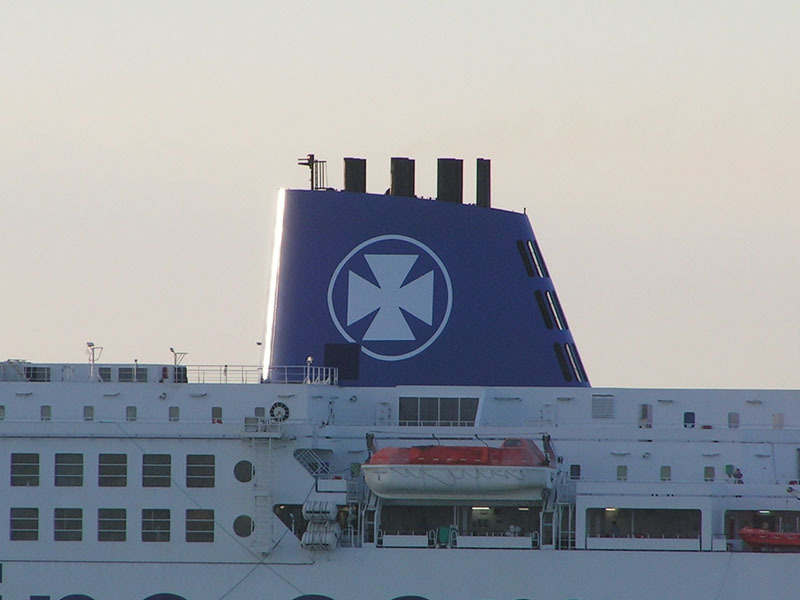 January 14th 2013 (0910 hrs): Left Dunkerque West and returned to ARNO suffering rudder problems. 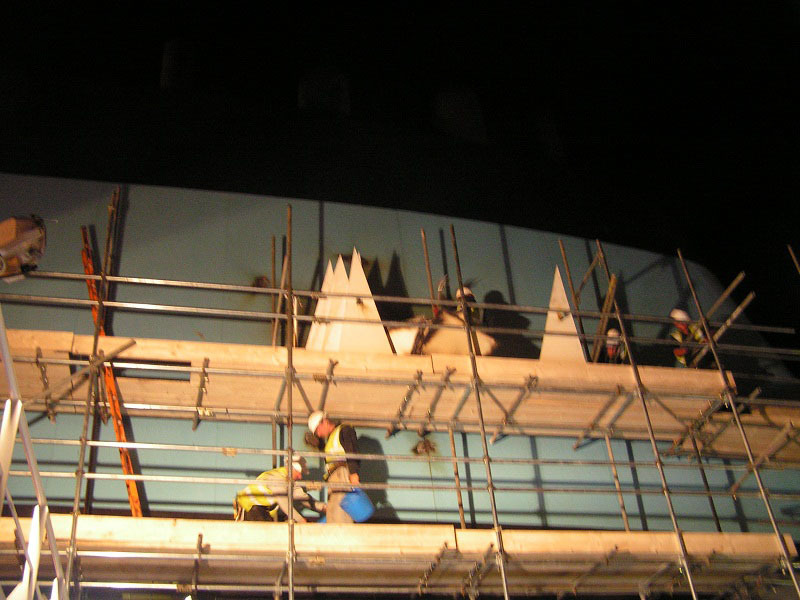 January 18th 2013: Left ARNO and resumed service. 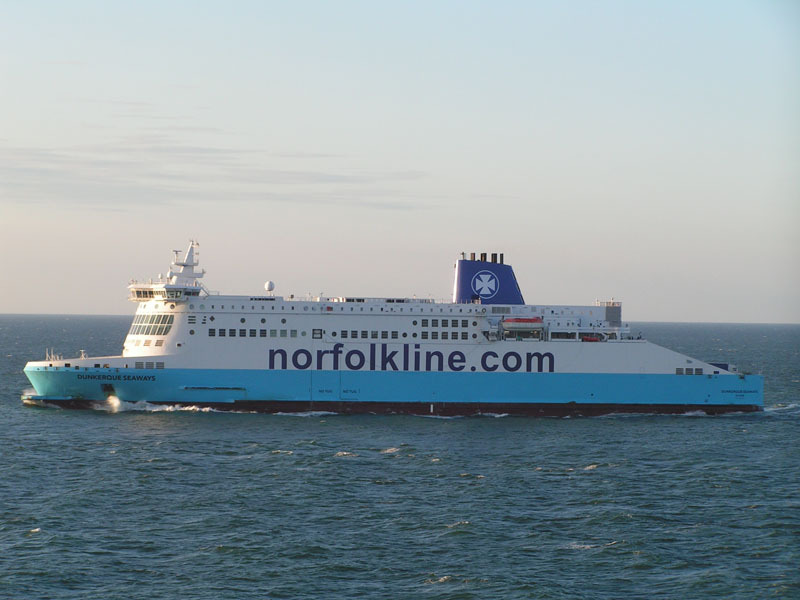 January 5th (23.15 hrs) 2014: Came off service at 2315 and sailed to Vlissingen for refit. 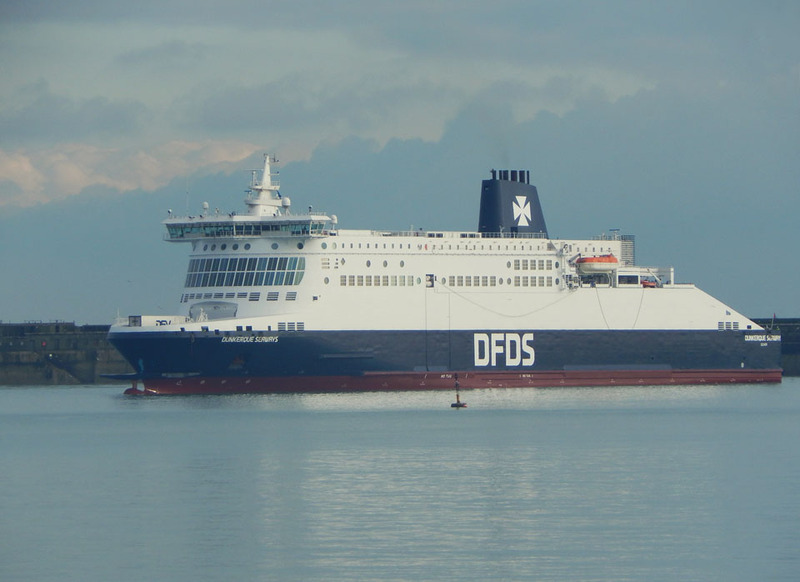 January 15th (18.30 hrs) 2014: She returned to Dover from Vlissingen then took up service with the 20.00 departure. 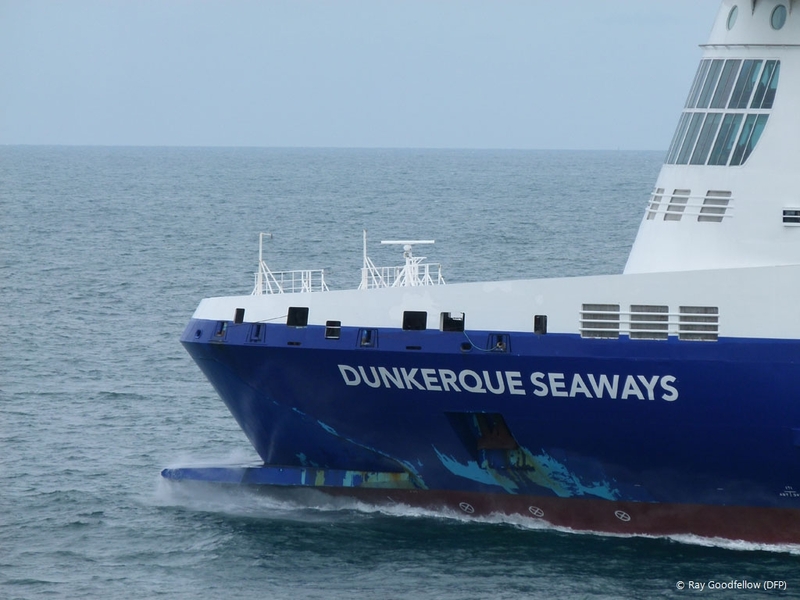 January 13th 2016: Left Damen yard and sailed to Dunkerque west. 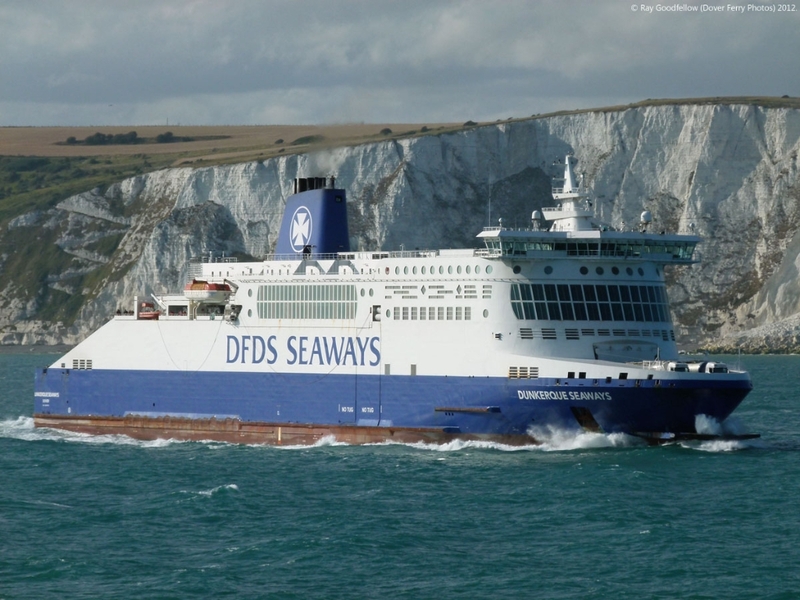 January 14th 2016: Resumed service Dover – Dunkerque. 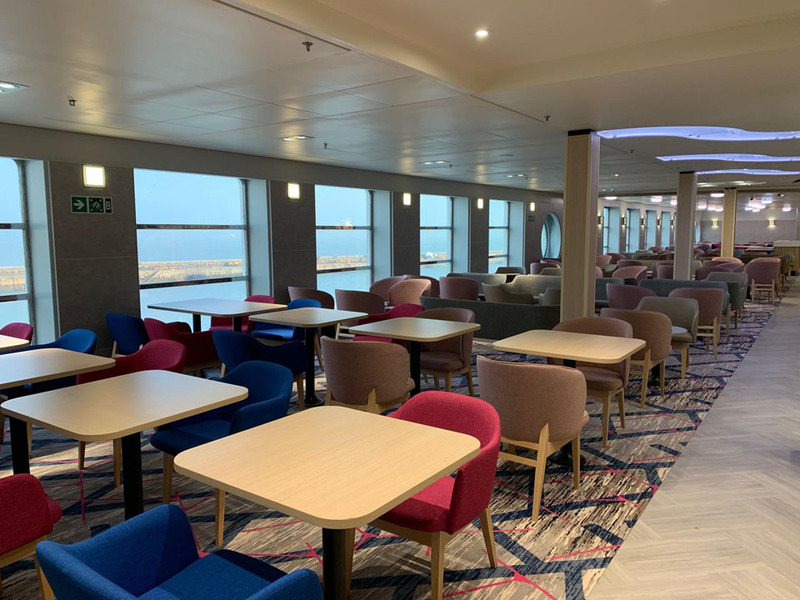 Work is well underway to give the three ferries on the Dover – Dunkerque Channel route an extreme makeover. 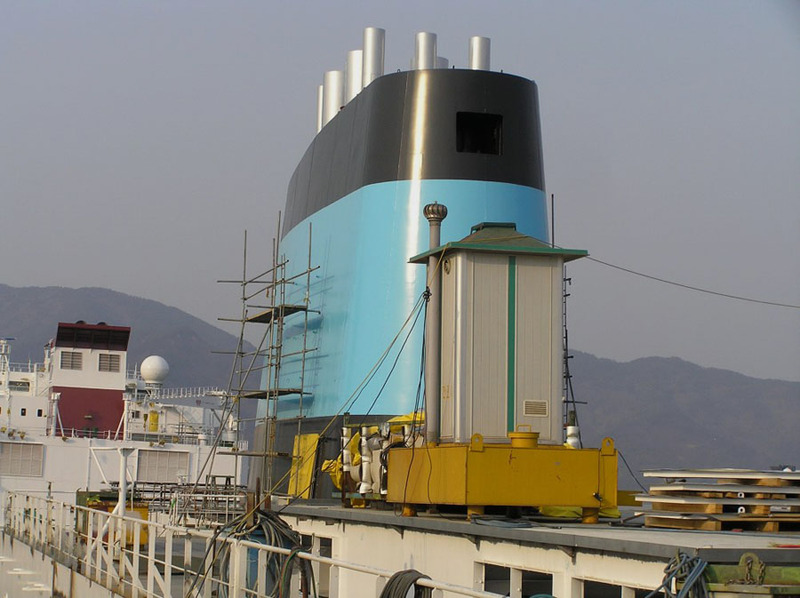 Up to 100 people are working at an increasingly fast pace to repaint and upgrade the ships’ facilities and technical areas. 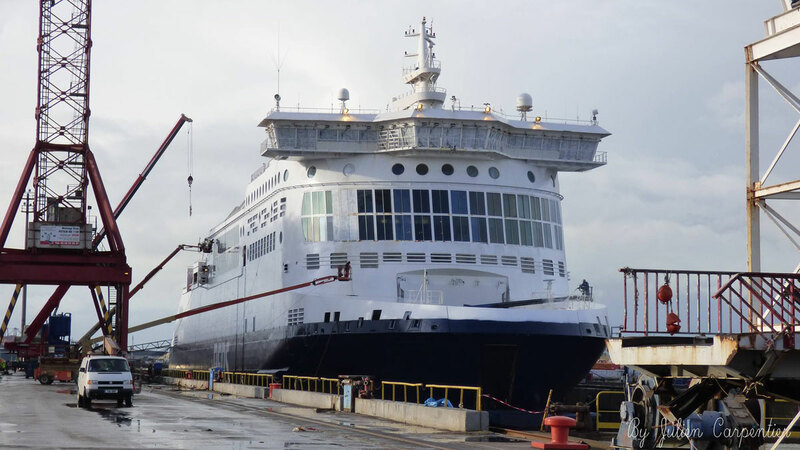 In less than five weeks, all three ferries will go into dry dock. 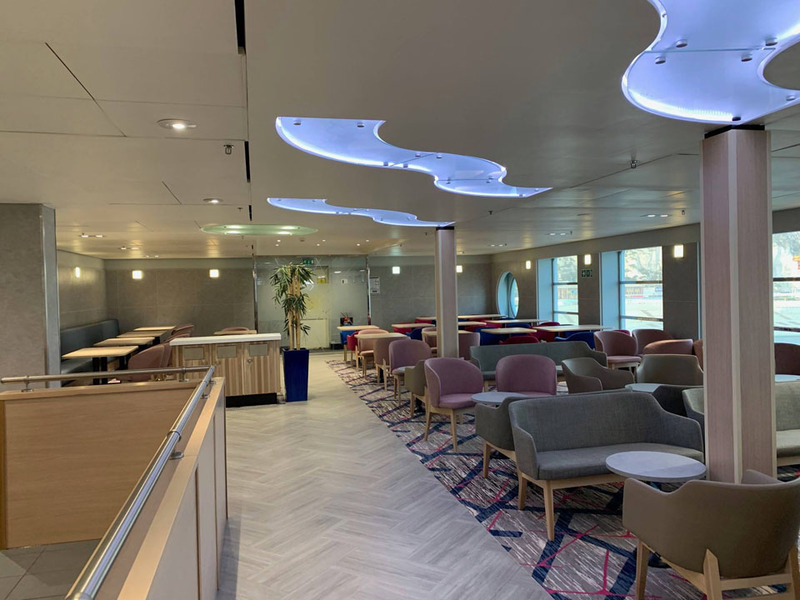 This requires a well-planned schedule (Click here to read how we plan such dockings) and the first ferry to put on a new livery was DUNKERQUE SEAWAYS. 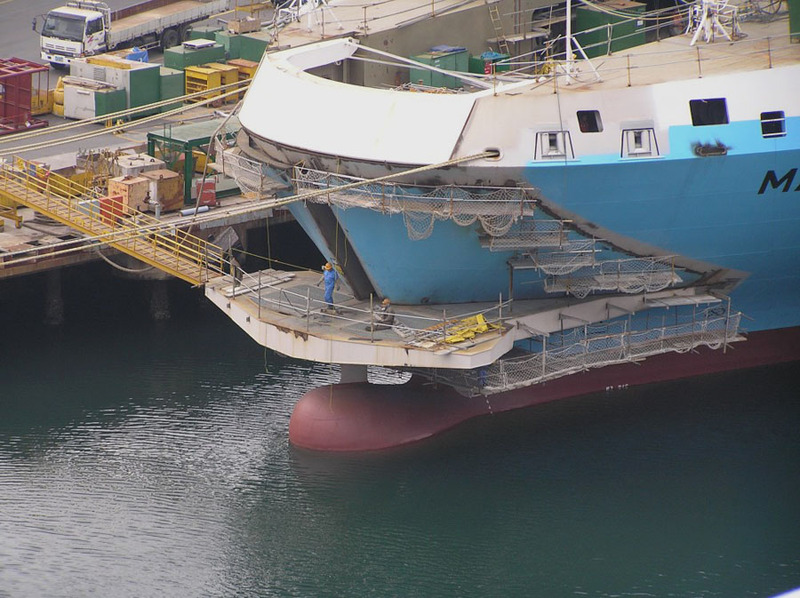 She went into dock in the first week of January. 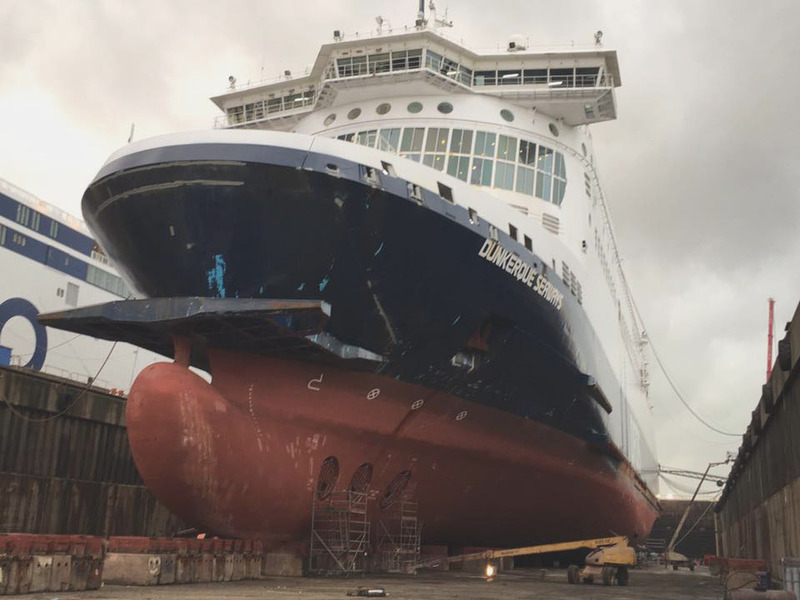 Last week DELFT SEAWAYS took her place, and we expect DELFT to be ready any time now. 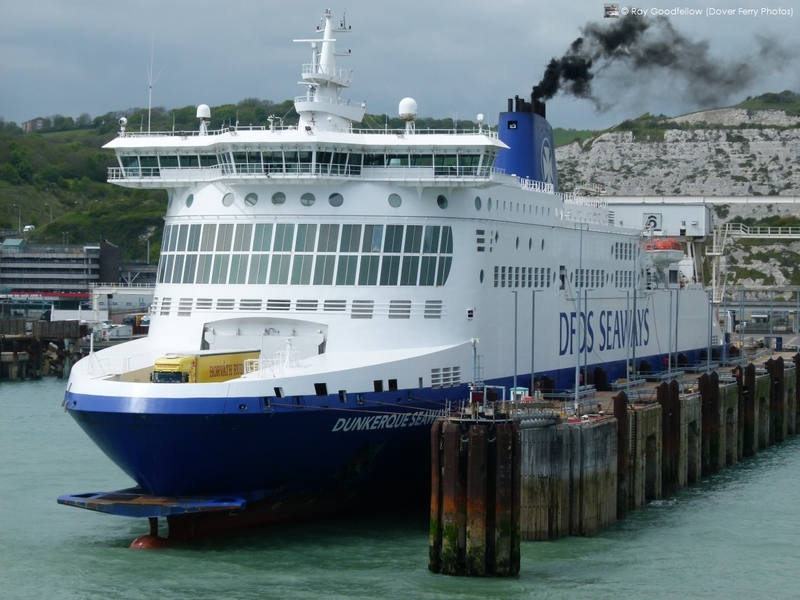 DOVER SEAWAYS will complete this year’s docking of the D-Class ferries and will be back on the route at the beginning of February. 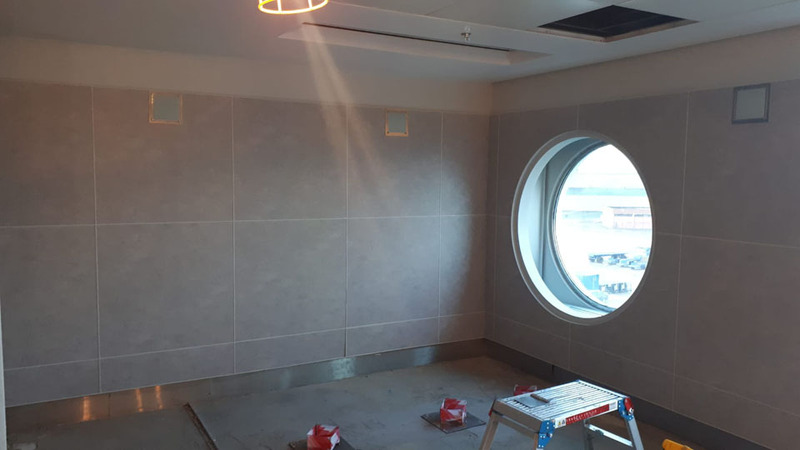 It is a busy five-week period! 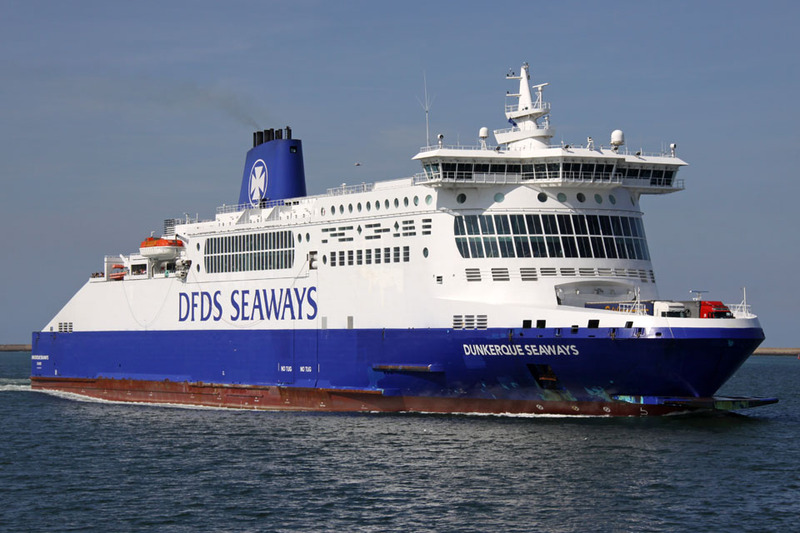 Each ferry will be repainted in DFDS’ new colours. 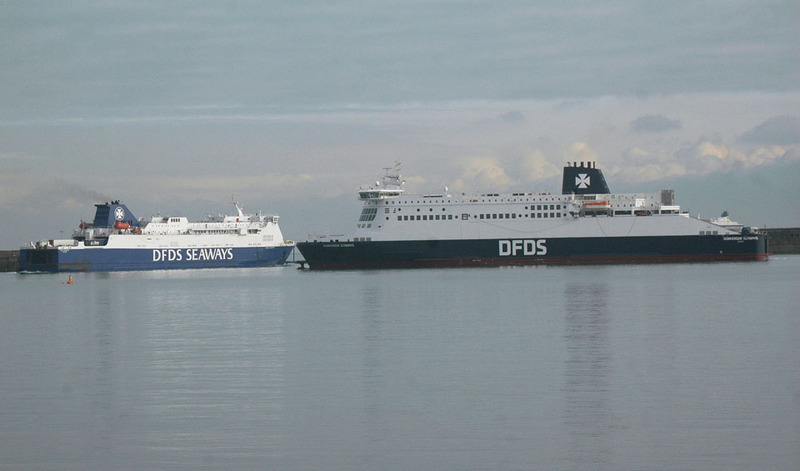 This requires 11,000 m2 of paint – or by comparison – two football fields of paint per ferry. 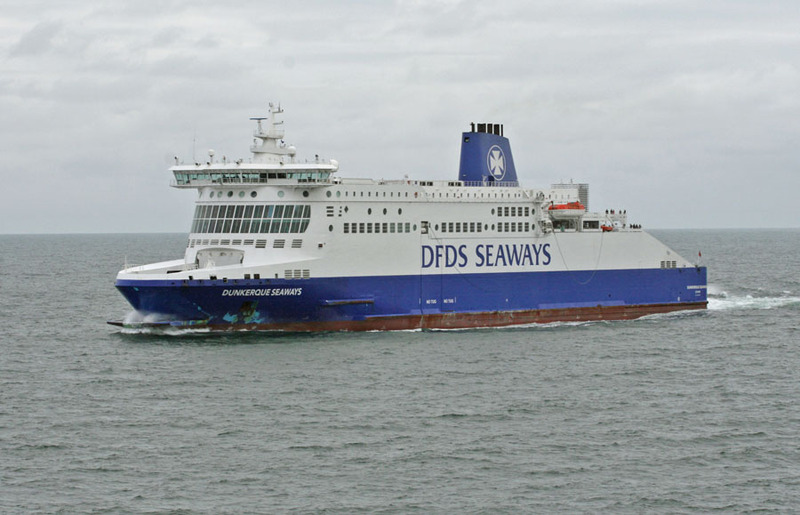 The new livery includes ‘DFDS’ as the brand name and a darker blue hull. 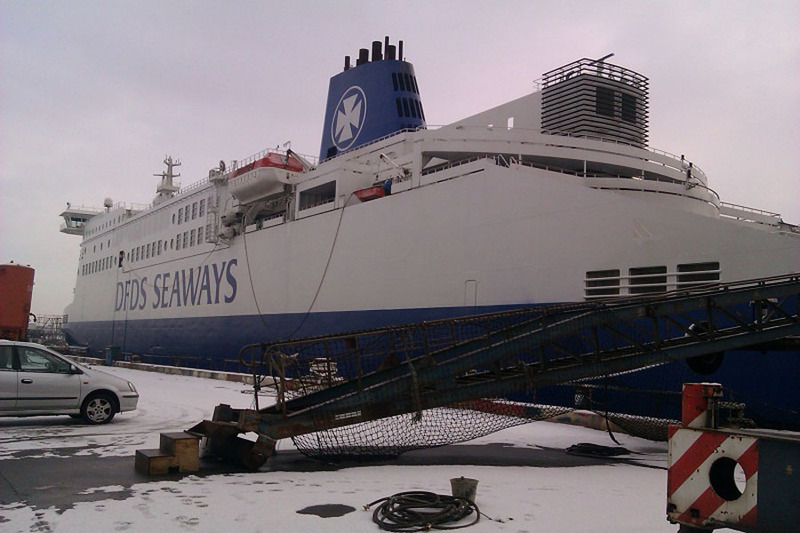 The result can be seen below on one of DUNKERQUE SEAWAYS’ first days in her new coat. What else have these nine days in dock been spent on? 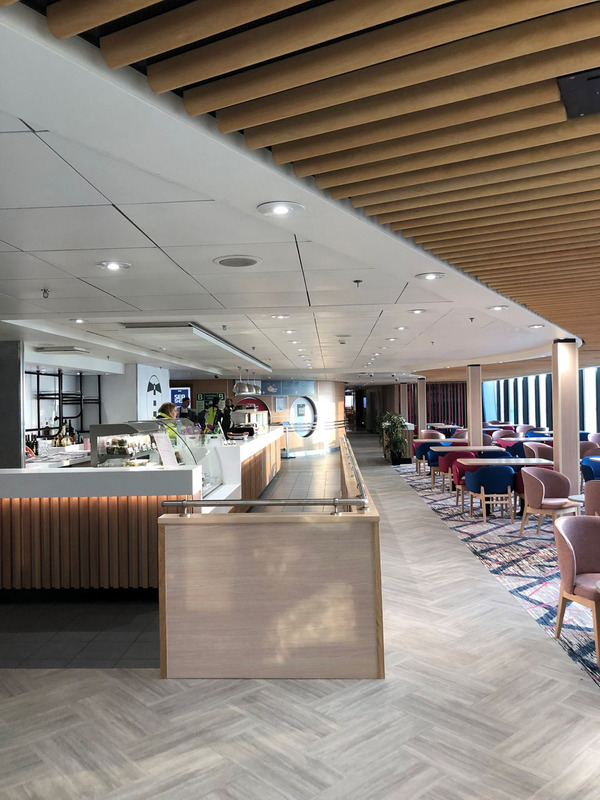 DUNKERQUE SEAWAYS has had the largest refit in years, and not just the repainting. 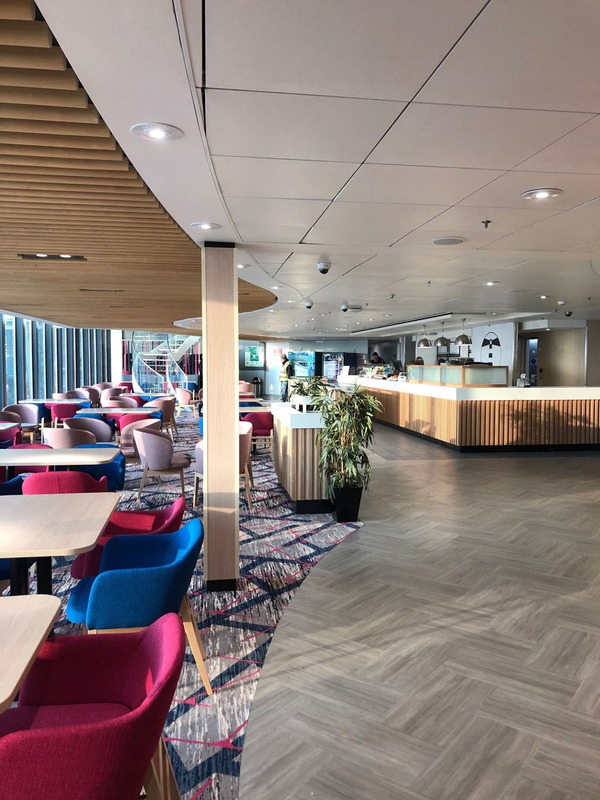 At the Damen Shipyard in Dunkerque most of the ship’s internal spaces were upgraded, from new carpets to toilets and the refurbishment of furniture and fittings. 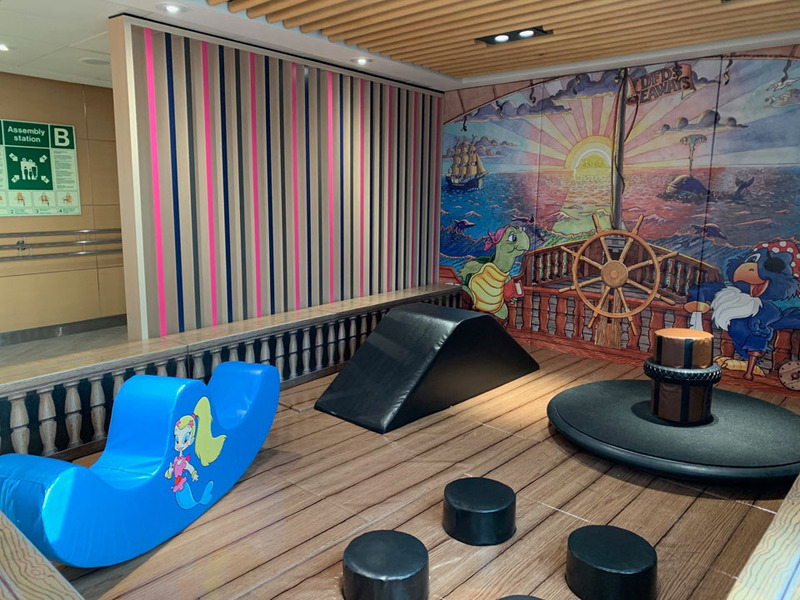 “With up to 100 contractors working at any one time, it was very busy with many demands on the ship’s staff to support them. 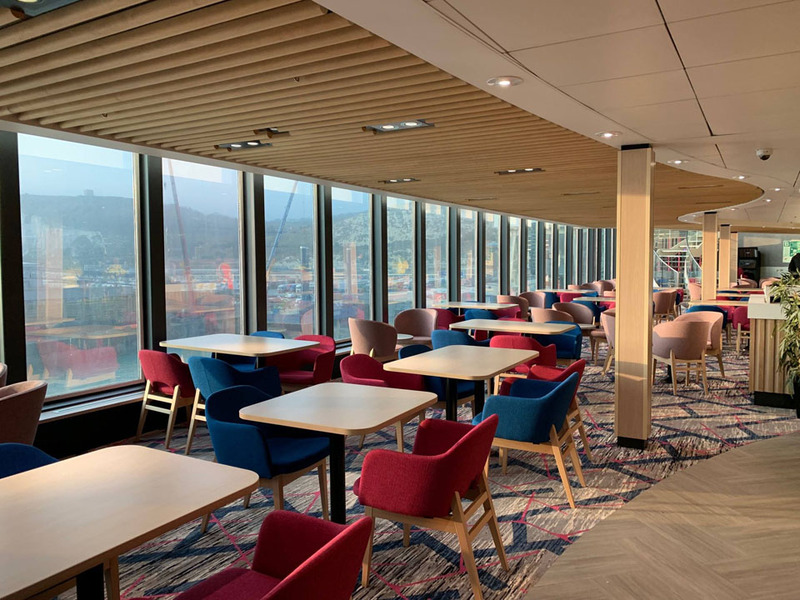 Meal times alone could take up to 2½ hours to get everyone through,” says Captain Andy Ridout. 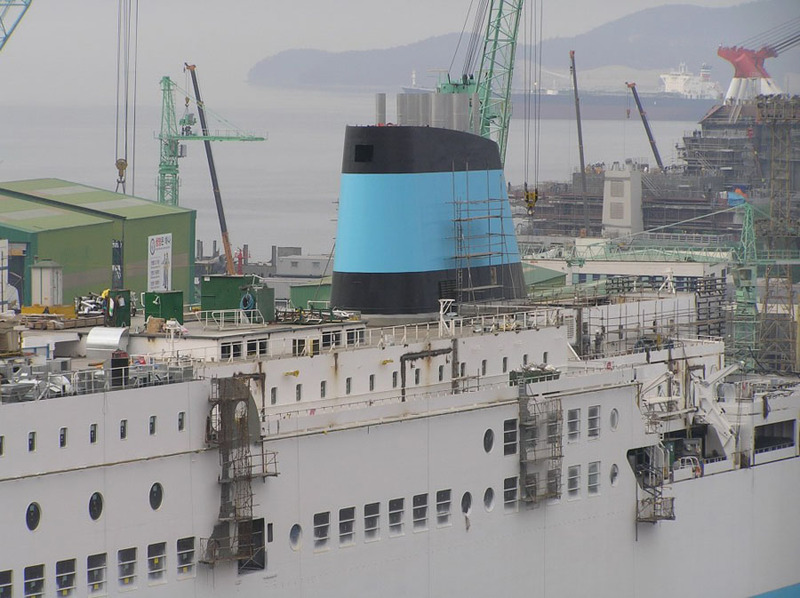 The technical work included DUNKERQUE’s bow doors being rehung, the ship’s rudder being overhauled, a thorough service of the engines, the stern thruster was overhauled and refitted, and the Kongsberg Power Management and Control System was upgraded with the latest hardware and software. 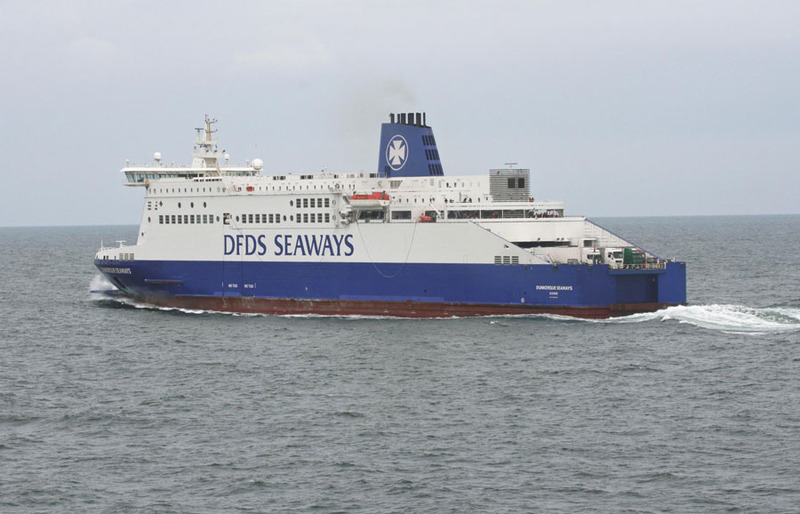 The jobs required an army of people who worked hard to get DUNKERQUE SEAWAYS out first. 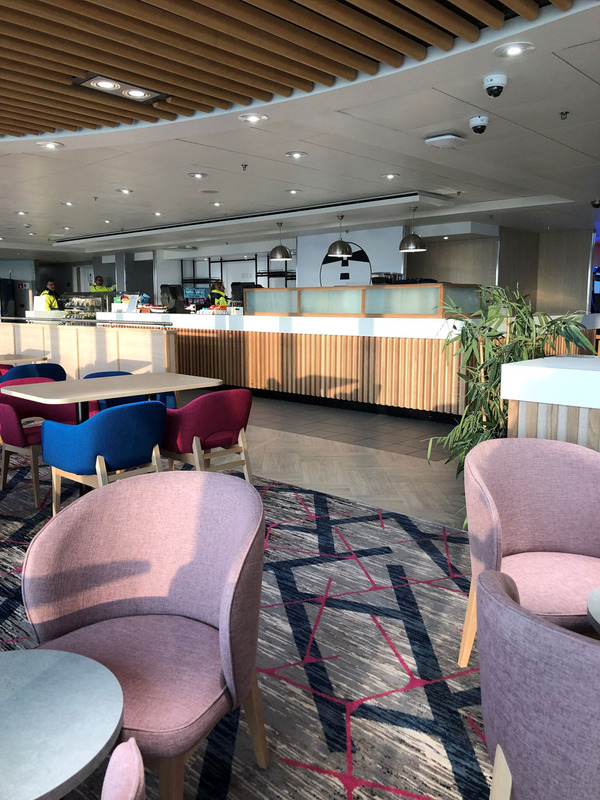 We hope you will soon be able to enjoy the upgraded facilities on our Channel ferries. 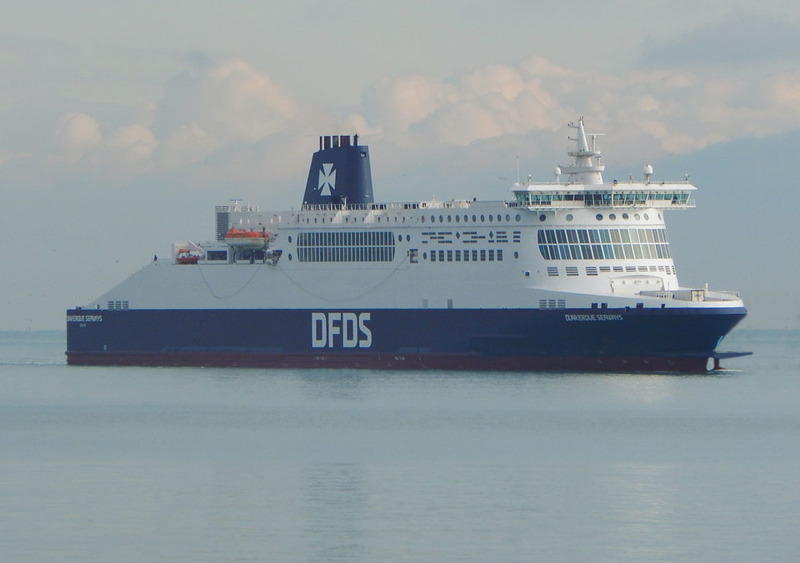 Please share and send your pictures of our ships to connect@dfds.com. 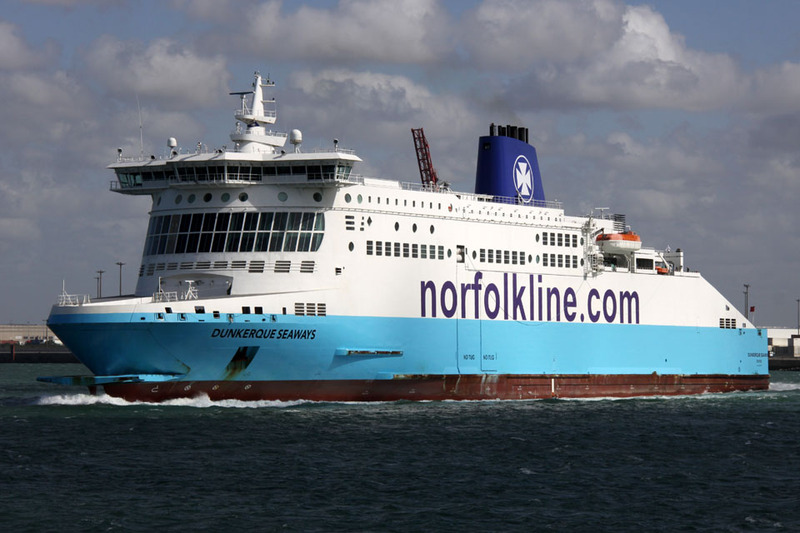 In the meantime, we will continue to get our other ships through the docking period. 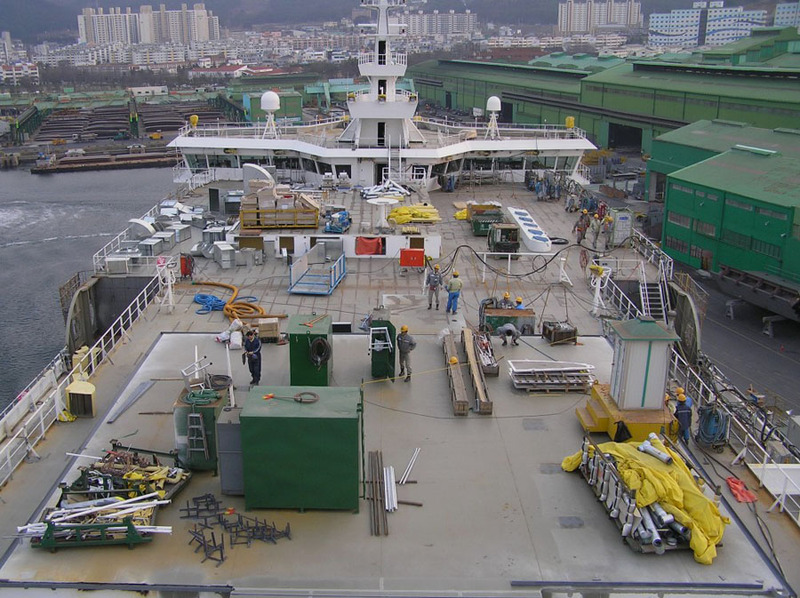 January 9th 2017: To Damen yard, Dunkerque for refit. January 16th 2017: Returned to service. 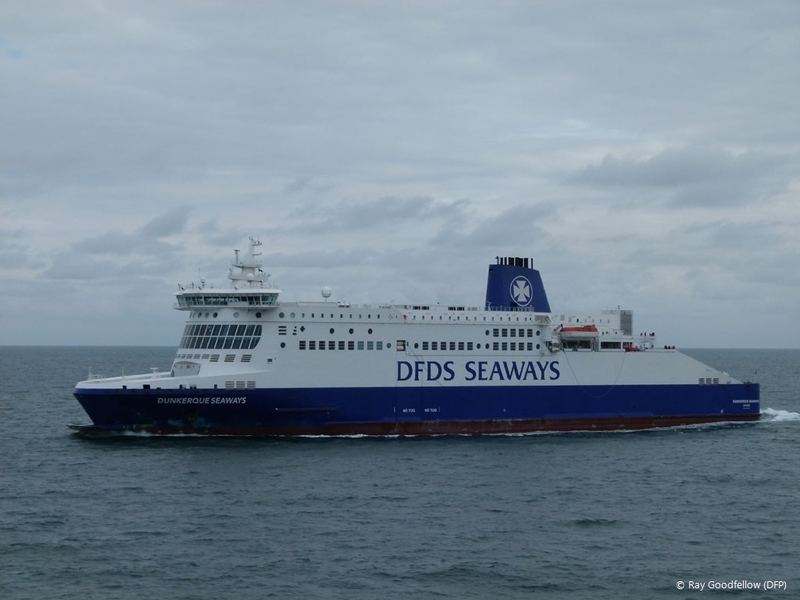 January 8th 2018: Came off service and sailed from Dunkerque (West) to Damen Dunkerque (East) for refit. 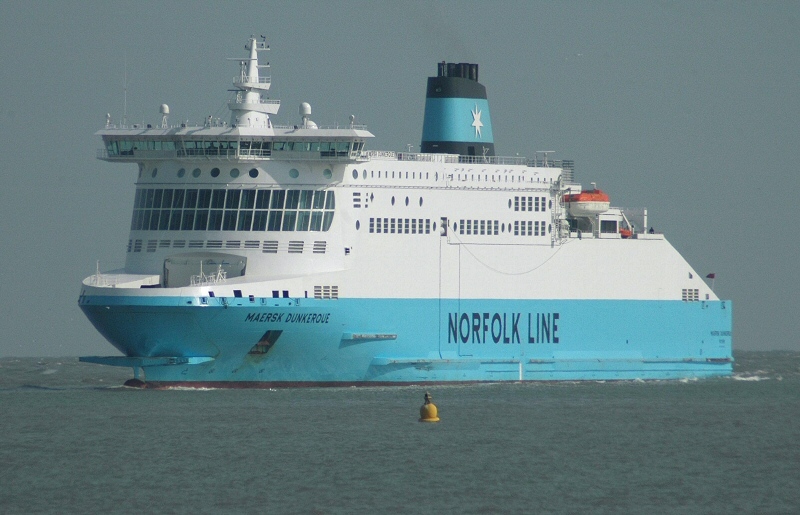 Upon completion she returned to service Dover – Dunkerque. 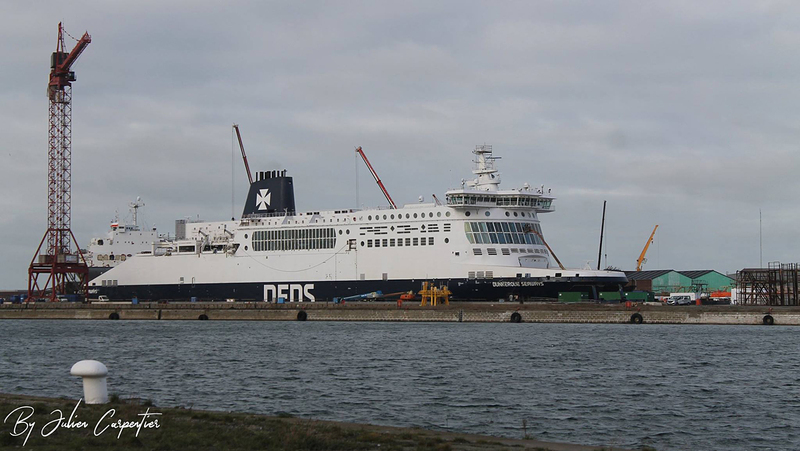 January 7th 2019: Came off service and sailed to Damen, Dunkerque for refit. 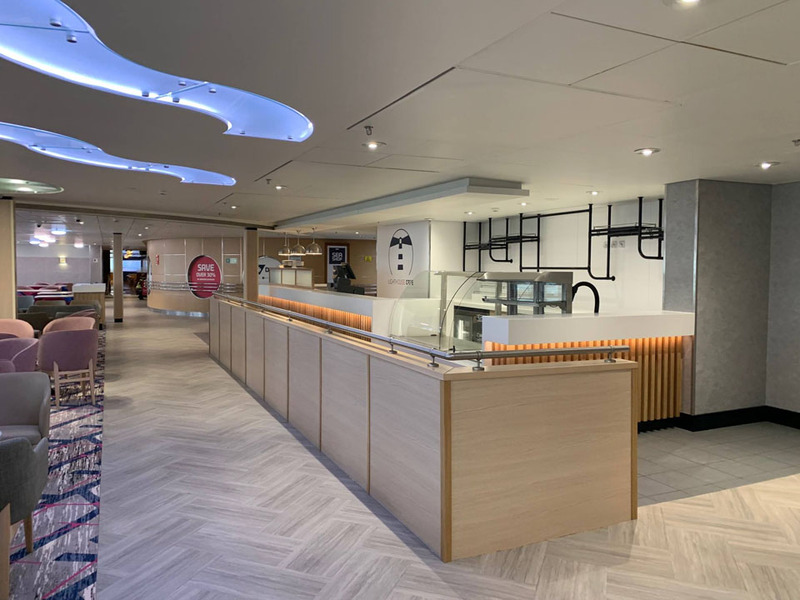 January 21st 2019: Completed refit and, after short sea-trial sailed to Dunkerque (West). All information is believed to be correct and no responsibility is accepted for any errors or omissions found. All items included in this article are subject to © copyright. 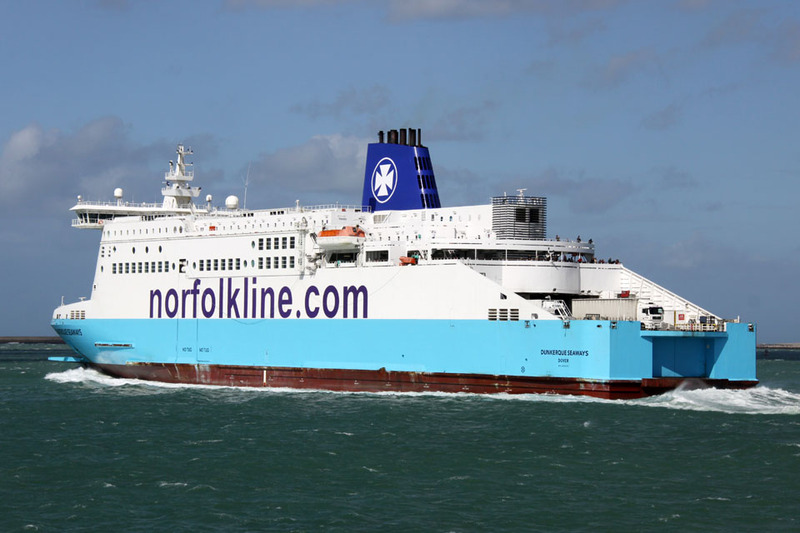 We would like to take this opportunity of thanking: Gary Andrews, Julien Carpentier‎, Ed Connell, Gary Davies (Maritime Photographic), Carsten Dettmer, DFDS Group , DFDS Enthusiasts , Robert Fournier, Co de Vos, Nigel Scutt (Dover Straits Shipping), Paul Smith, Chris Whitfield, and Andreas Wörteler for their assistance in compiling this feature. 1. 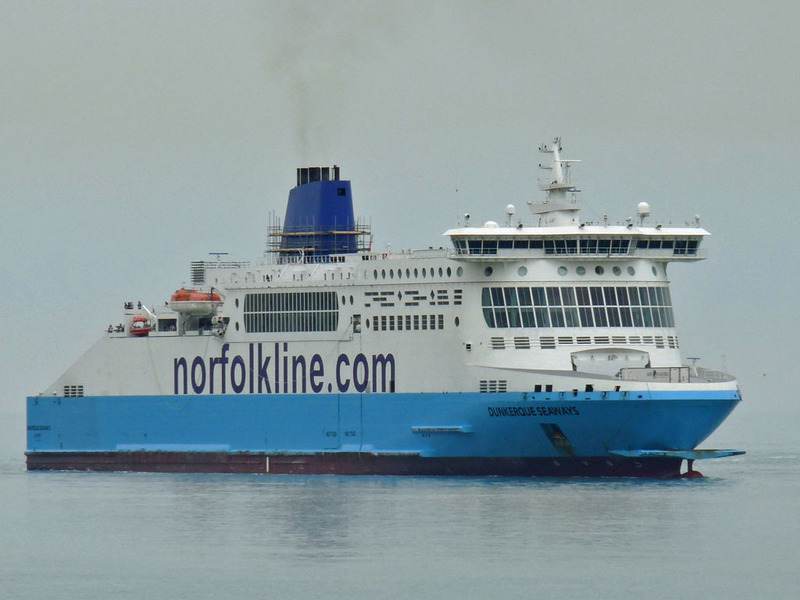 We had previously sailed on the same vessel on the Friday and it made what seemed to be an awkward berthing at dunkerque, firstly reversing towards the birth then spinning ship around to birth at the front as normal. 2. 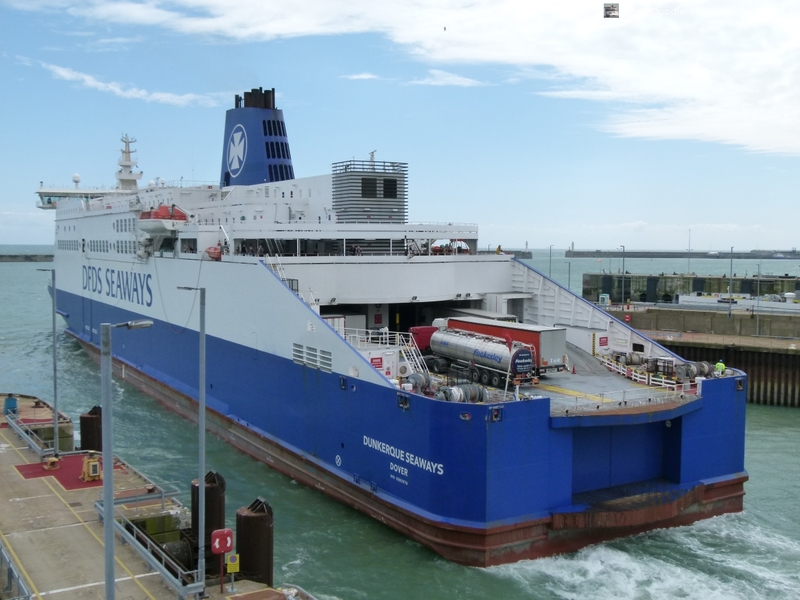 When we boarded the vessel to return to dover, the ship was reversed onto the birth and we boarded from there which is not the norm at dunkerque. 3. 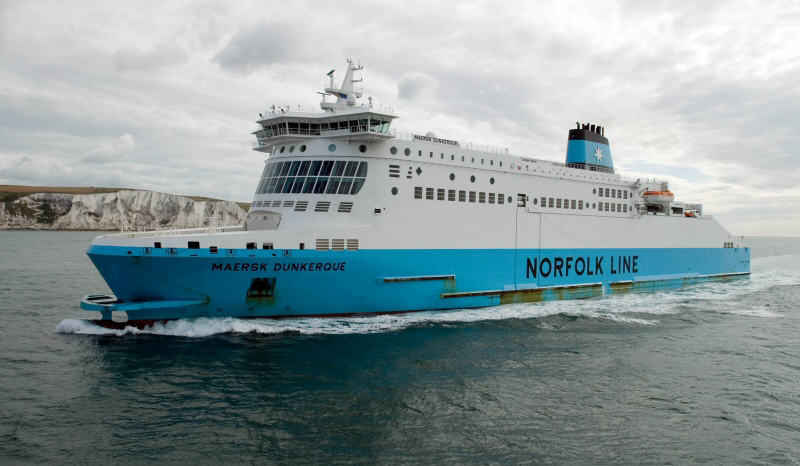 Then as we were birthing at dover I can only describe the birthing maneuver as awkward, going into dover 3 at a sharp angle at which the vessel then hit the pier separating dover 3 and 4. Anyway I just thought I would share this experience with you. Adam from stoke on trent. 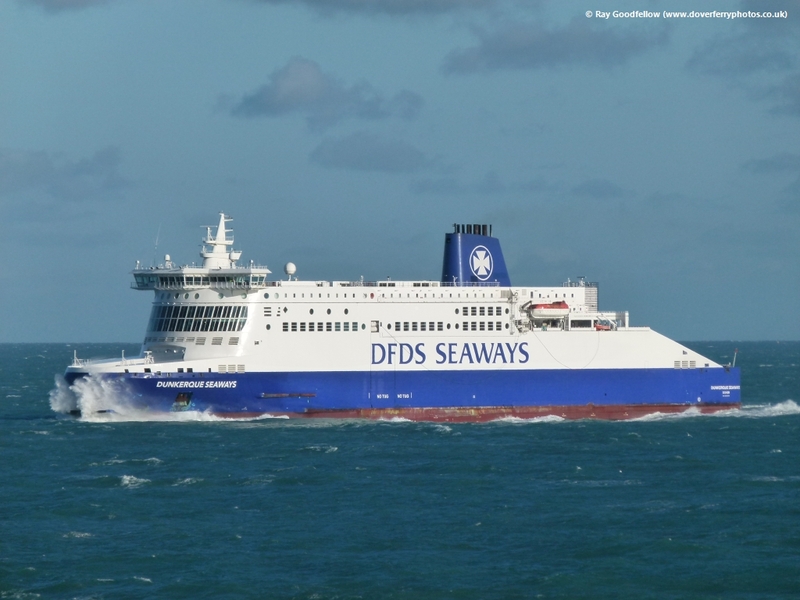 Thank you for the information and the overview of the events involving the Dunkerque Seaways. I would also like to thank you for the kind words about the website, it’s nice to know that people like and read the articles we produce. 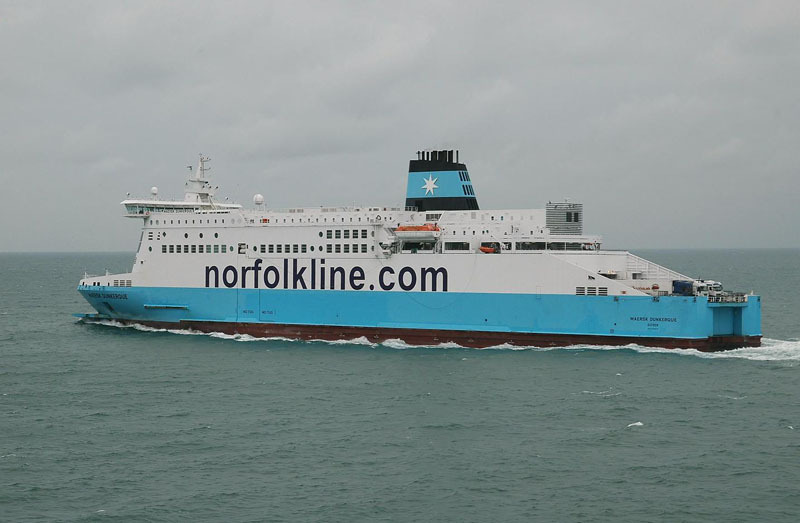 Hi, well I was surely surprised to look at pictures of the formerly Norfolk Line and now DFDS line. 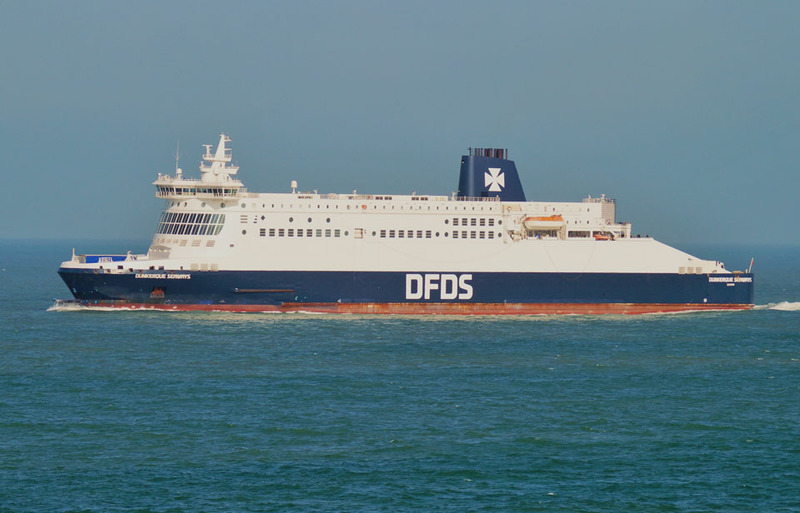 I have travelled with all tree of them, the Dover, Delft and the Dunkerque from begin 2011 till November 2011 before that I travel by train from Calais to Folkestone. I was a charter for the Nedexco company, who’s gone broke in 2012. 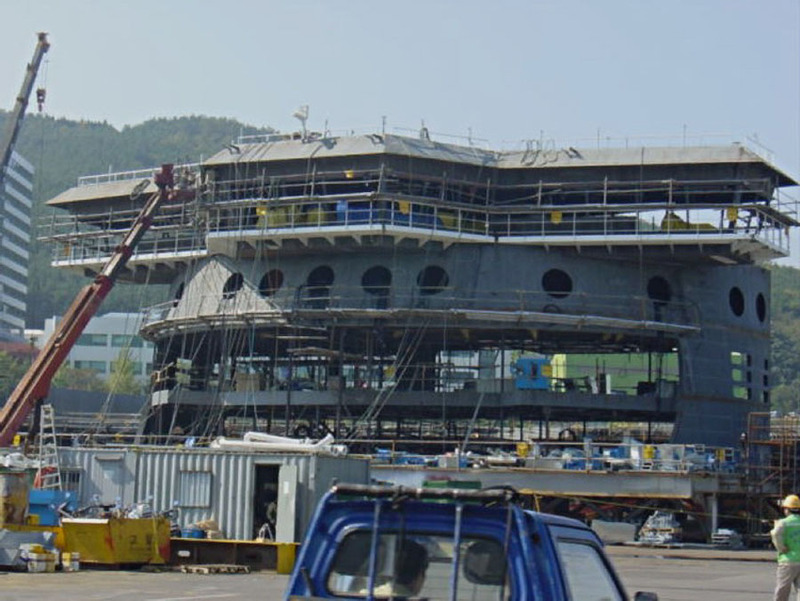 The pictures of the building of the ship in Korea were great thanks for sharing, I will made a link to your website on mine because I won’t steel your pics. 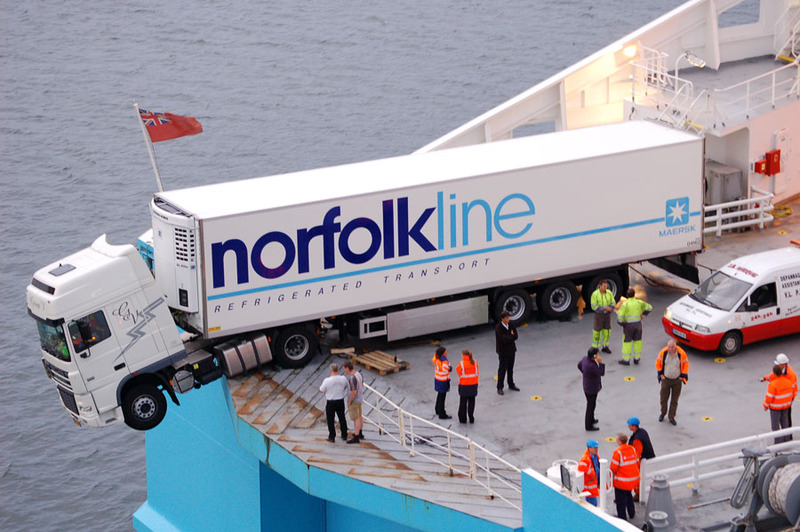 I was for 35 years a truckdriver and drove a year for my own but bad business and crises had put down my business. 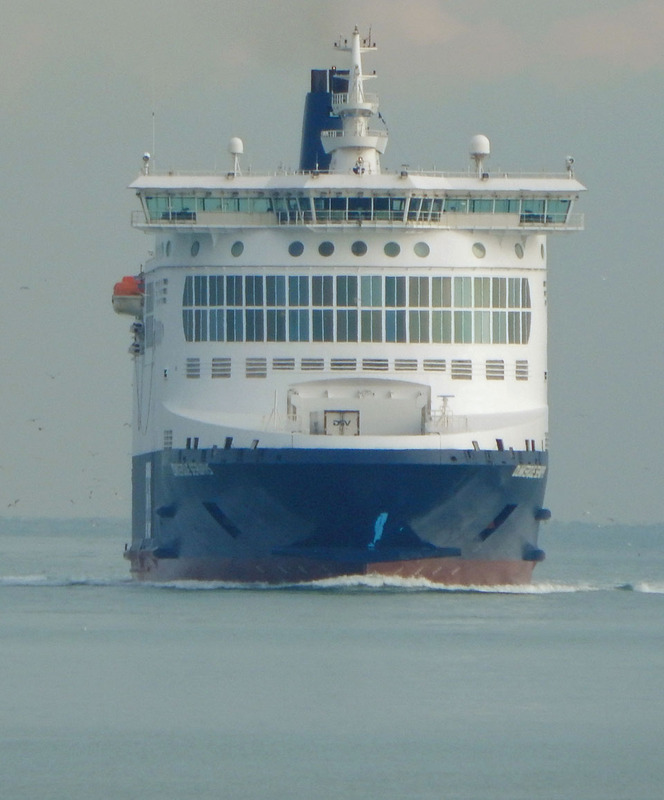 On my website are some video’s and slideshow’s of traveling throughout Europe. 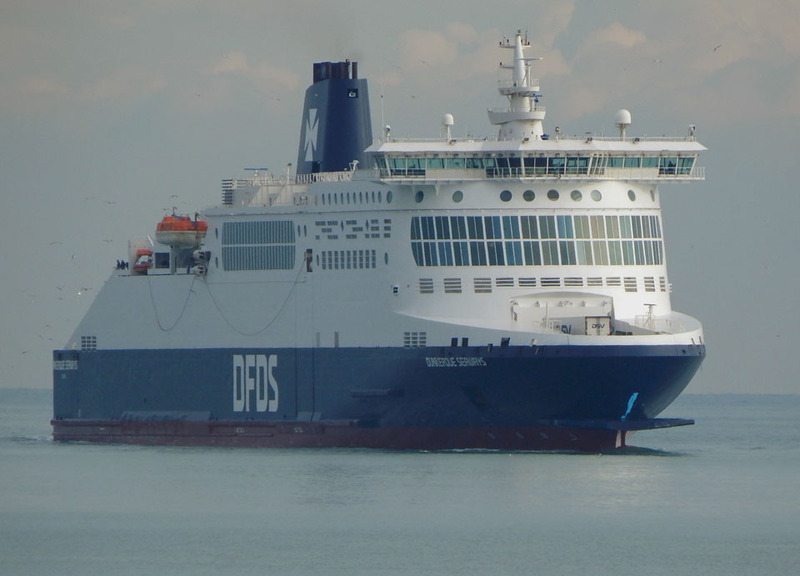 I’m still busy with a renewing of one of my slideshow’s and this the travel (well work) as a own driver throughout Europe including travel from Dunkerque-Dover. 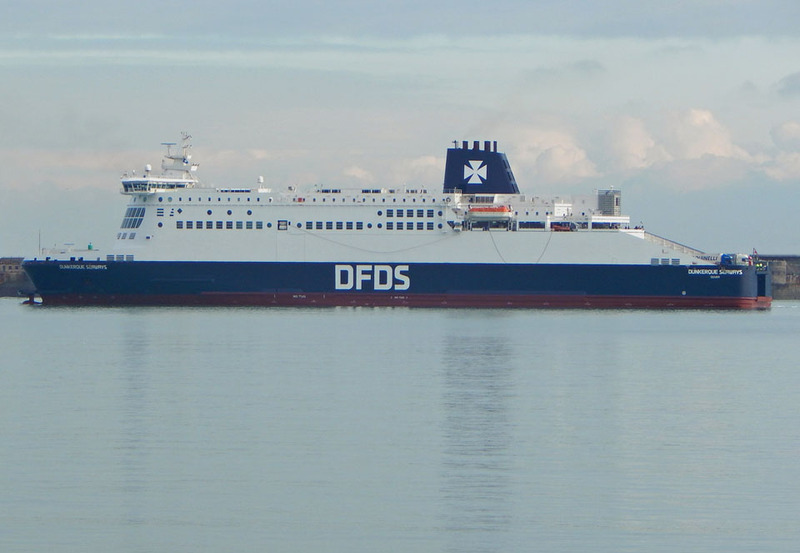 I have also going through Oostende to Ramsgate but I’ve discover that Trans Europe Lines are broke-up so no one has a line now to Ramsgate I’ll think they were the only one. 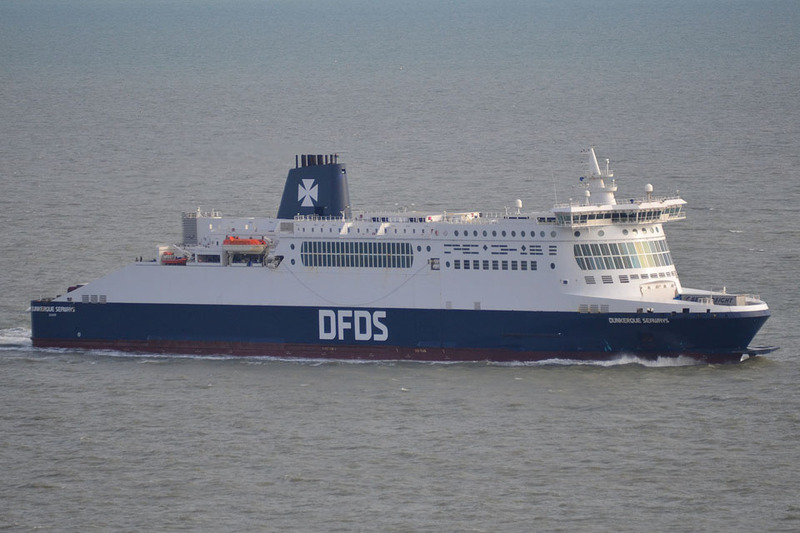 from Scheveningen-Felixstowe and later from Vlaardingen-Immingham and of course Calais-Dover vica versa, crossing the channel for many times I must say. Thank you for taking the time to leave a comment on our website, it’s greatly appreciated. 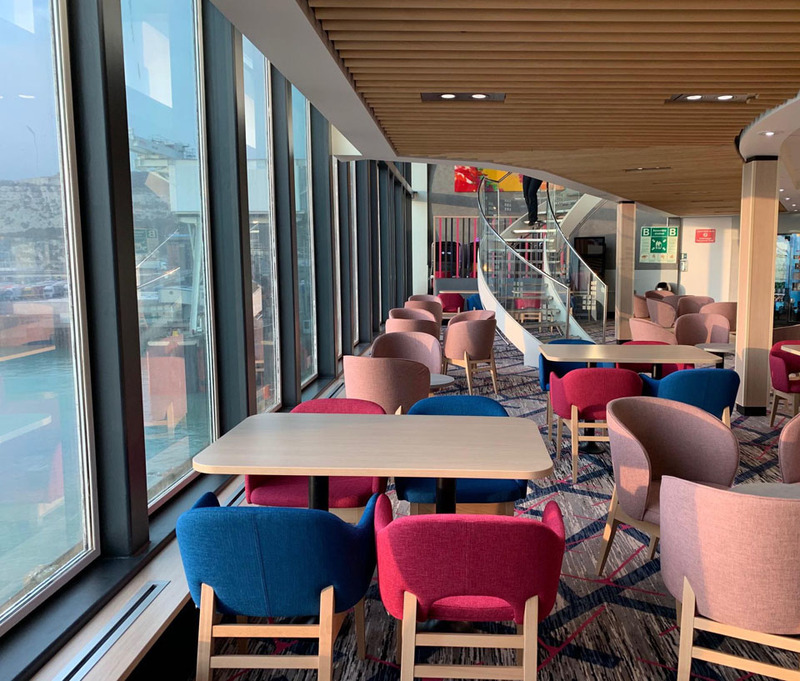 It’s always nice for us to hear people’s stories and what connection they have with the ferries that we document. Thank you for adding a link to our pictures rather than `stealing’ them, to much of this occurs on the internet nowadays. Once you have updated your website please get back in contact and I will add a link to your site from our own. This slideshow contents photo’s from 2000 till 2009 when i was working for a employer, later in 2011 i’ve been working as a own driver using a firm name THM Transport, also on my website as a slideshow and many traveling to the UK. 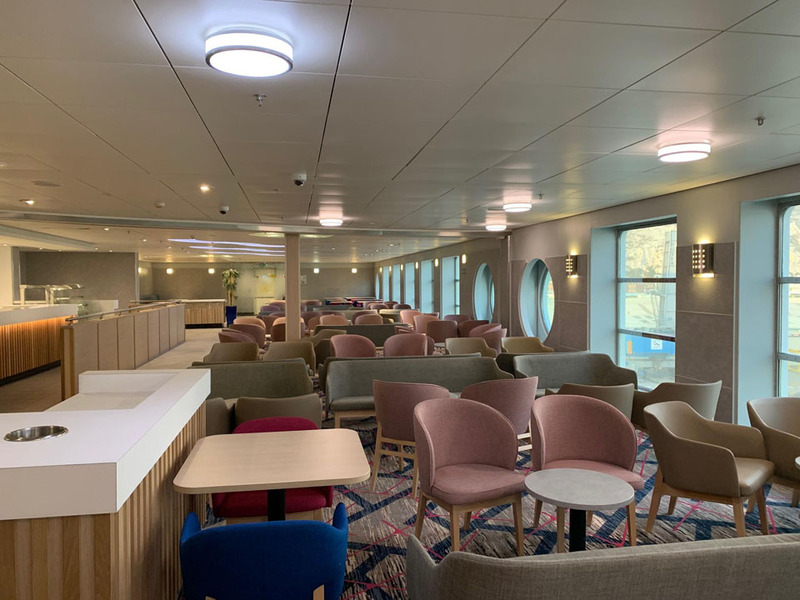 I have some photo’s from the HSS Stena Discovery the fast ferry, landing at Harwich i was at the moment at the harbor site, could i send those to you? They are also been on the slideshow mention above.